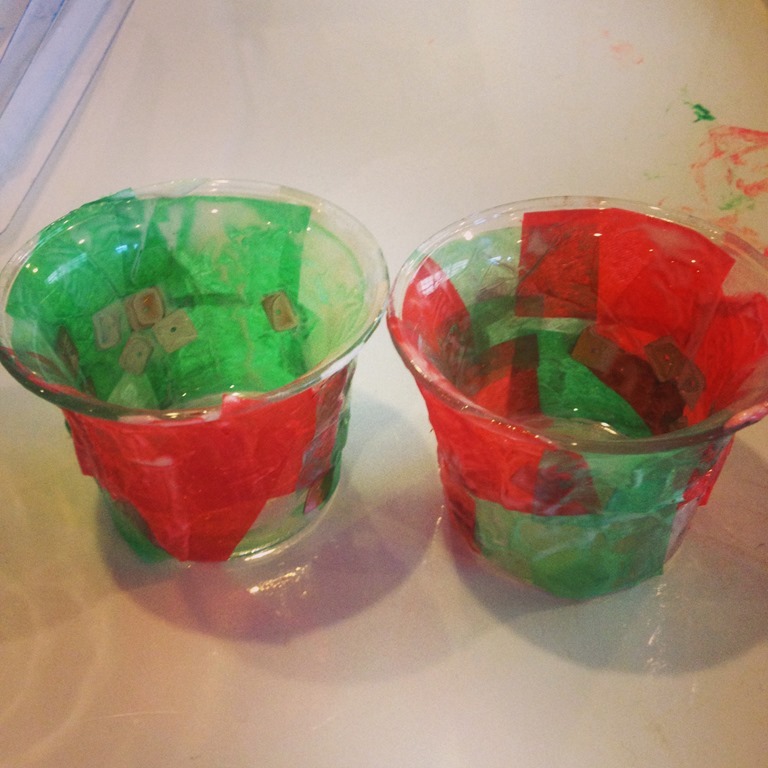 A few weeks ago I got out a large basket of “pop toobs” and a small container of marbles. 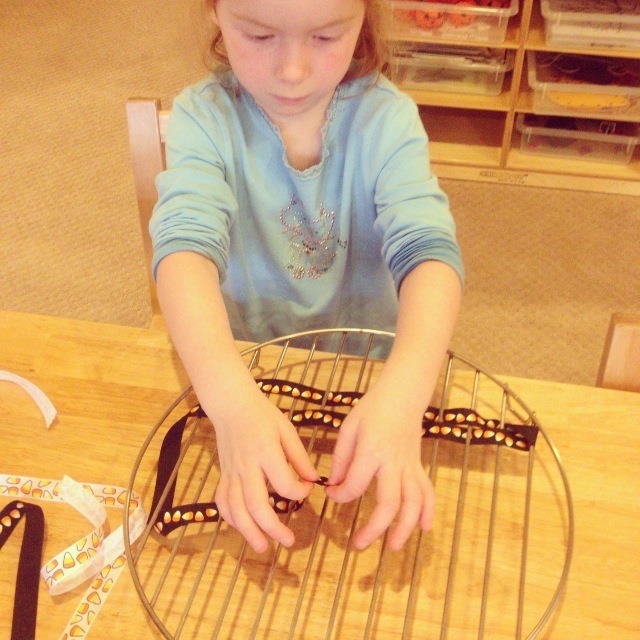 The children started making intricate connections of tubes and circles to put the marbles in and out and through. It didn’t take long before the long connections of pop tubes were taken up to the tippy top of the loft. 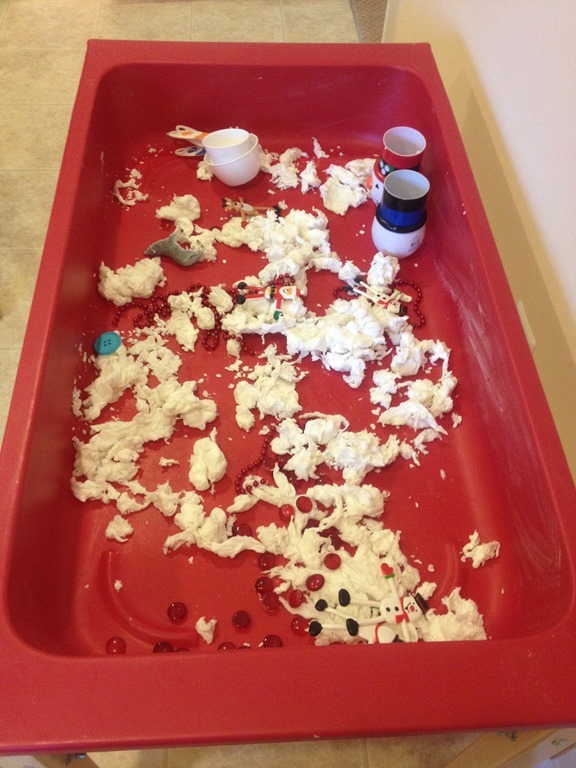 They soon started sending marbles from the top of the loft down the carpet area. 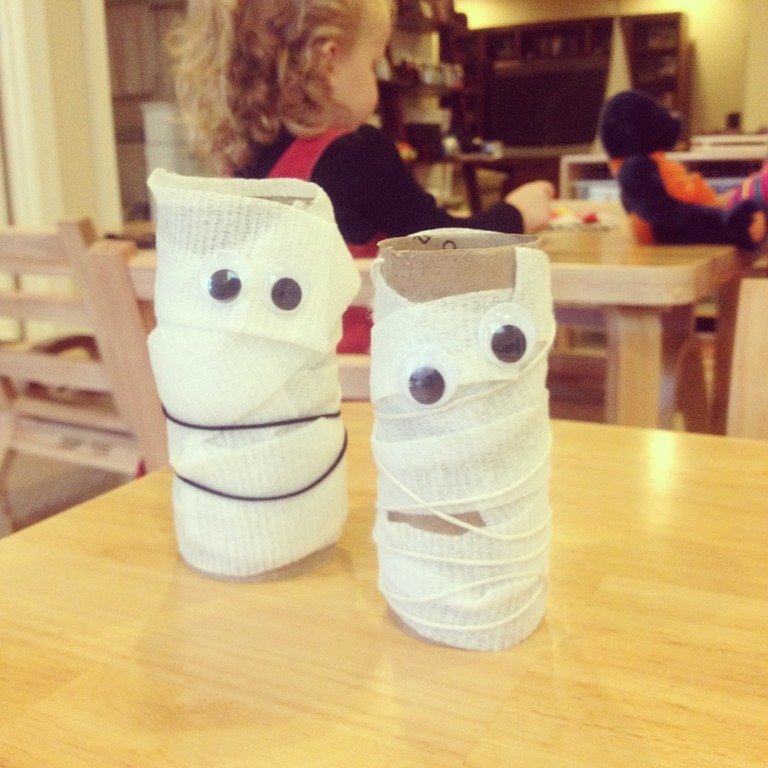 I got out a large roll of blue tape and the kids would tell me where to tape up the tubes and we had them winding all around the loft. At the end of the morning there would be large piles of marbles underneath the tubes on the floor. 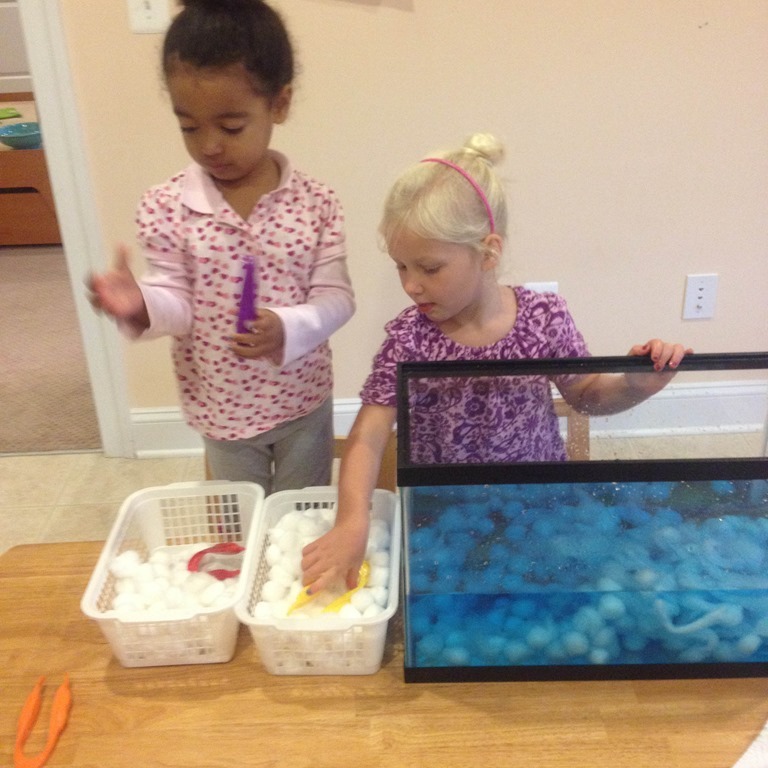 This past week some of the children started to add the ramps and tubes to make different endings for the marbles as they came out! 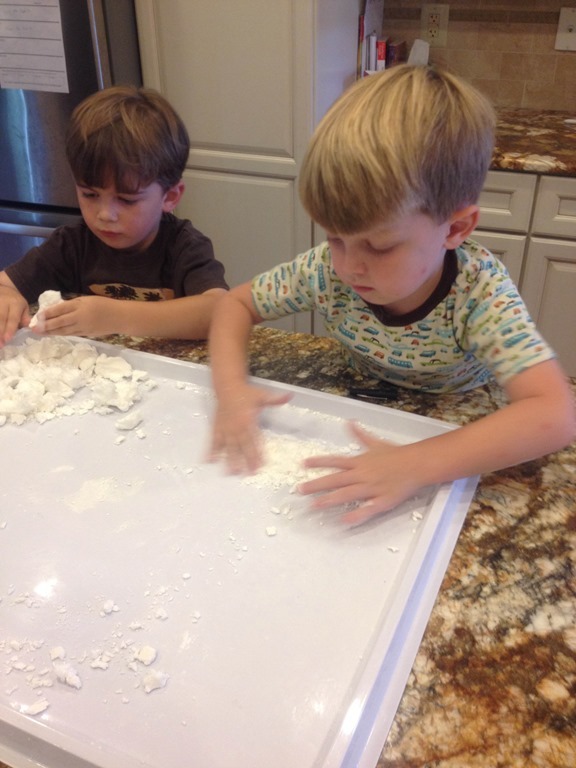 I observed them adding parts, testing them out, taking out tubes, and attempting to make the marble go farther and farther. To encourage this idea of different ramps and motion I pulled out our Hape Quadrilla marble run. 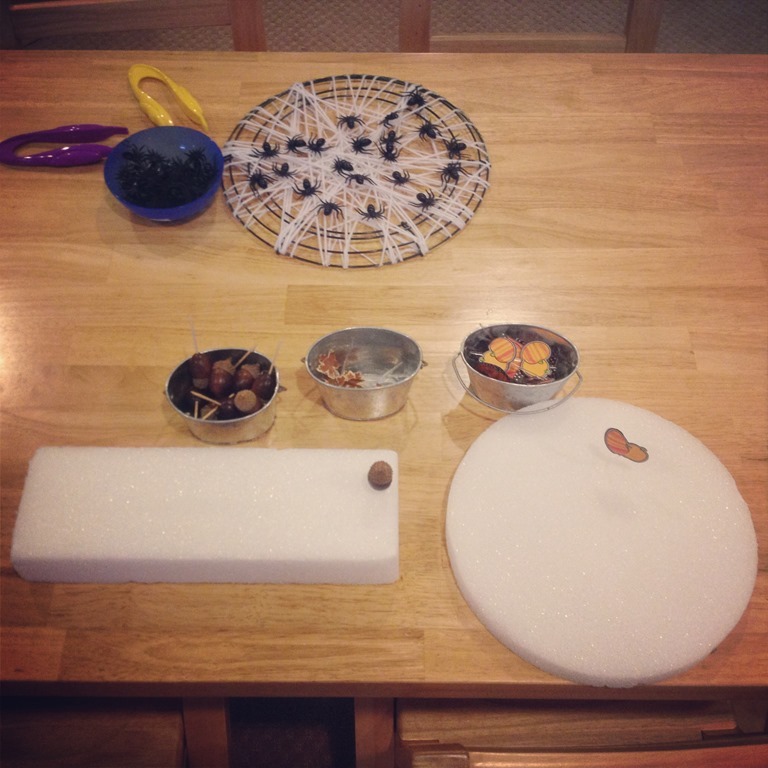 We learned about all of the pieces and set it up to watch the marbles in motion. These marble runs are quite tricky and got knocked down easily, but this taught us a lot about patience and building it back up after it had fallen down! Then their ramps got even more advanced. They asked me to move the tubes so they could go down the ramp off of the book shelf. 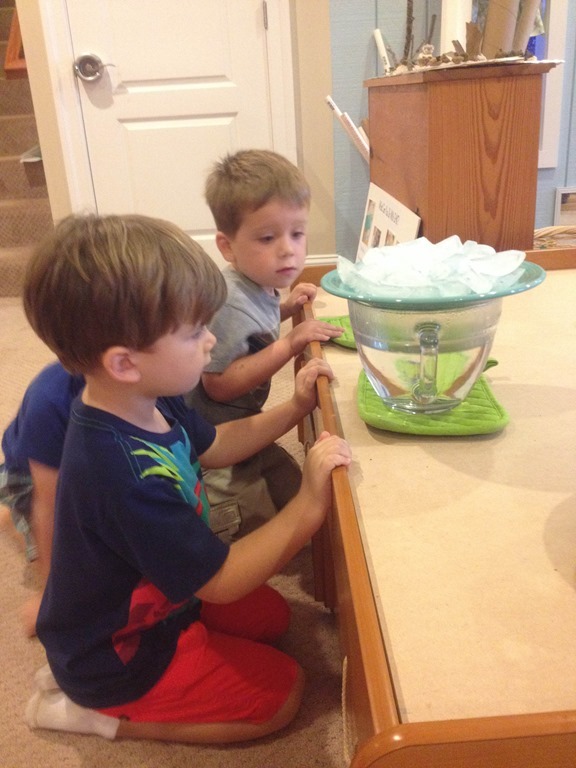 Here is B, M and H each sending down marbles to inspect where they are landing. 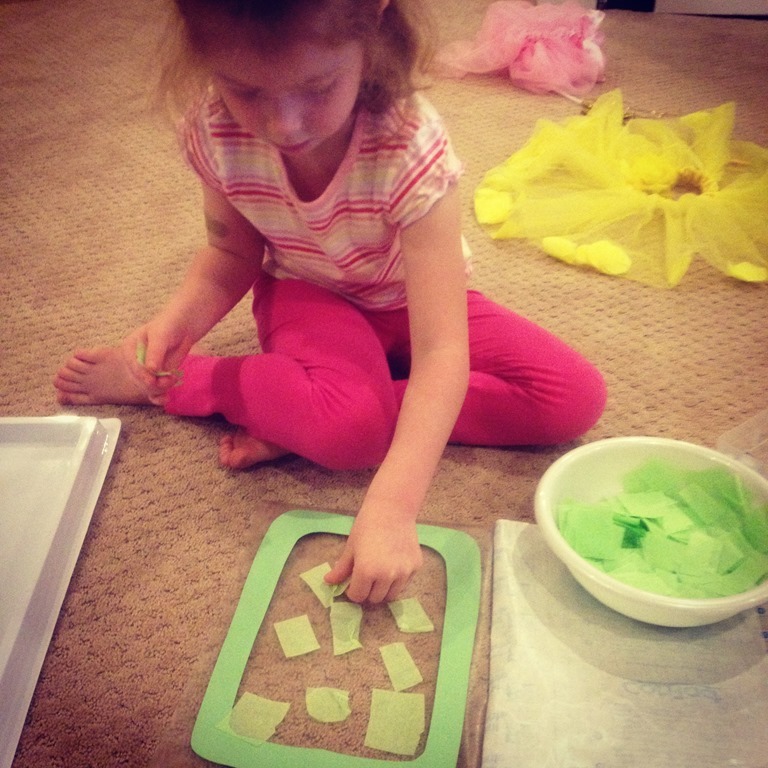 T wanted to make a barrier for the marbles, and created this little half of a square to keep the marbles in after the rolled down the ramps. 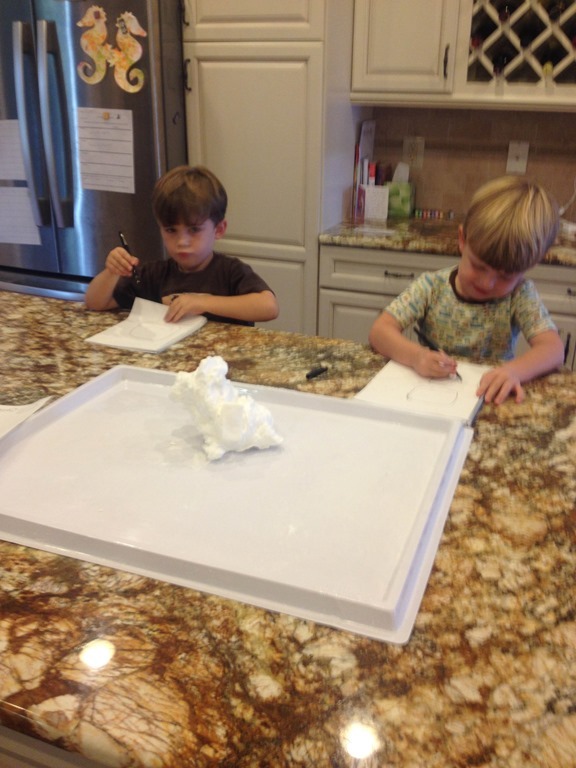 I can’t wait to see what marble creations are next! 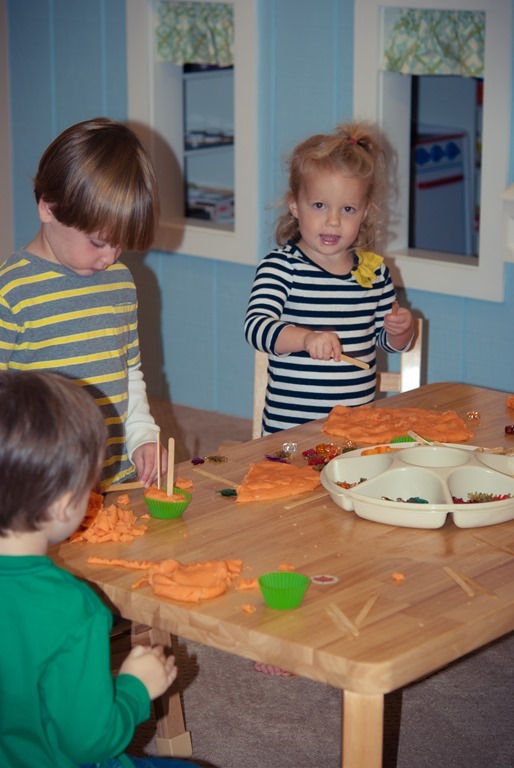 Categories: early childhood education, reggio emilia inspired | Tags: marble run, marbles, play based preschool, playmatters, preschool math, preschool science, reggio inspired | Permalink. 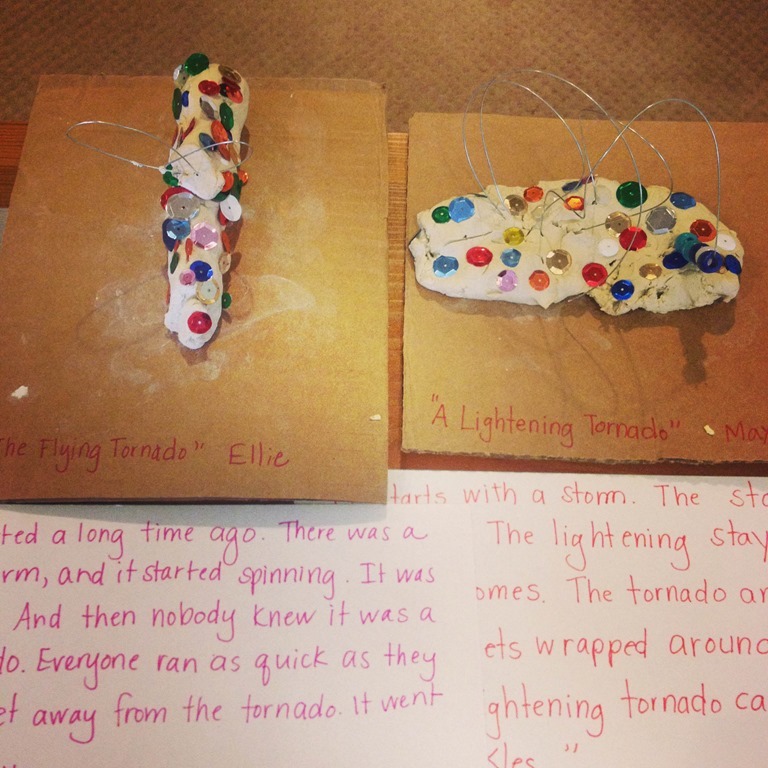 Within the first few weeks of school, one of our students began talking about some of the big summer thunder storms that had rolled through recently. 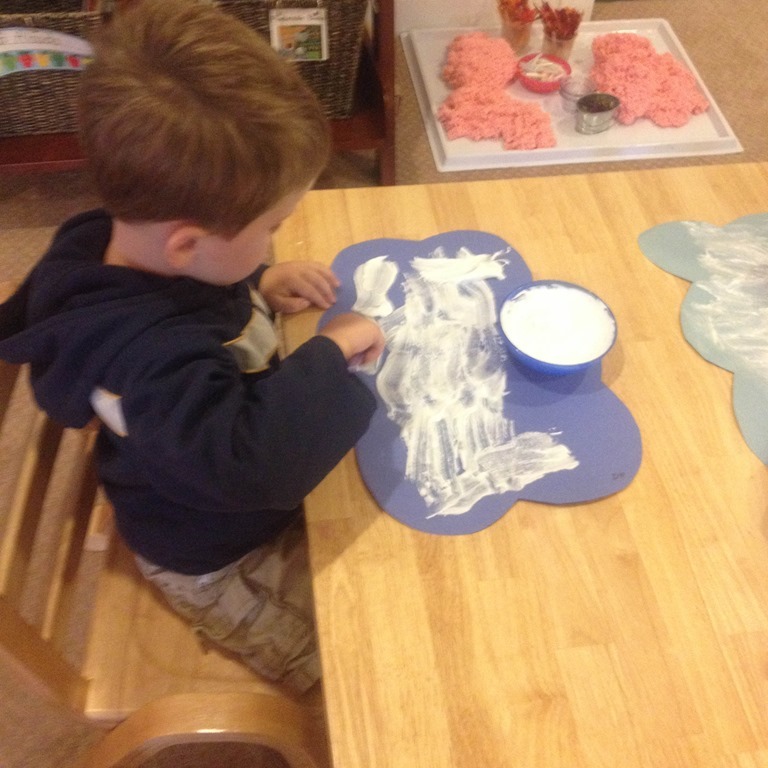 He drew a picture of a large cloud on our chalkboard and called it the “thunder factory.” That got me thinking about what the children already knew about storms and rain clouds. We had a large group discussion about the weather and each child had thoughts about the rain and big thunder storms. 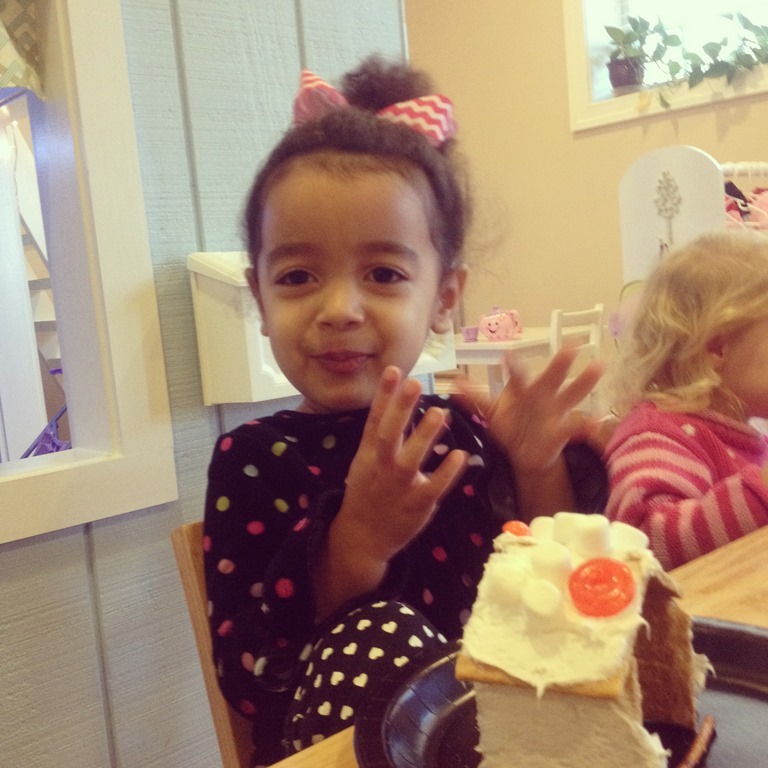 Everyone in the class has previous experience or specific stories to go with this topic. I thought it would be great to explore it further! 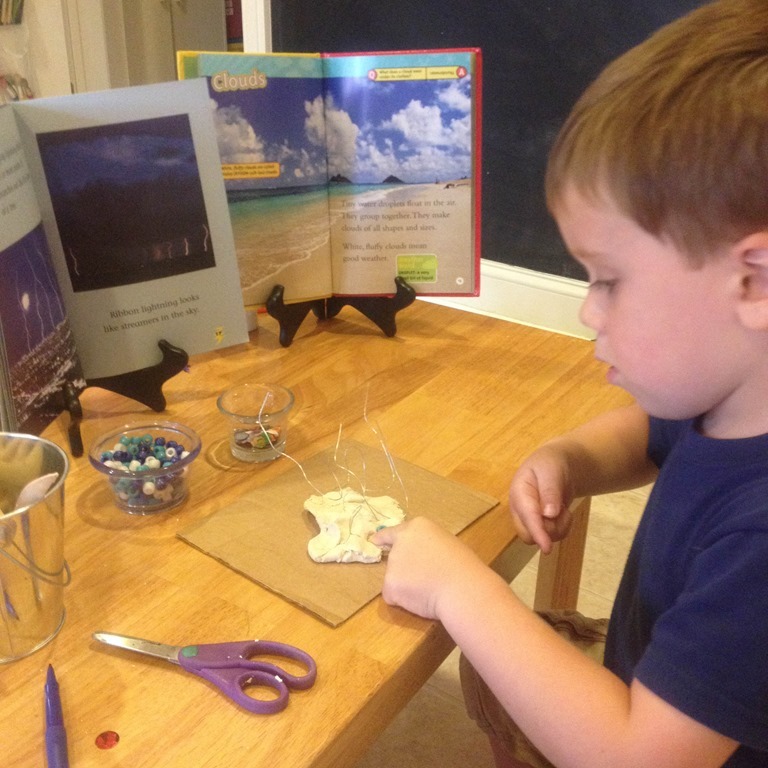 I found a series of science experiments and art projects online that correlated with learning about rain, rain clouds, and different types of weather. We started our discussions with rain, since that is where the idea began. 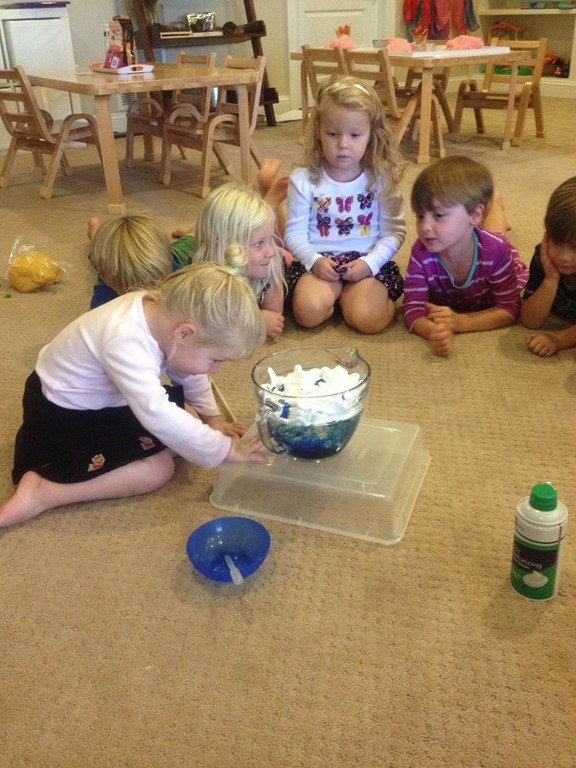 First we made a large scale rain cloud. 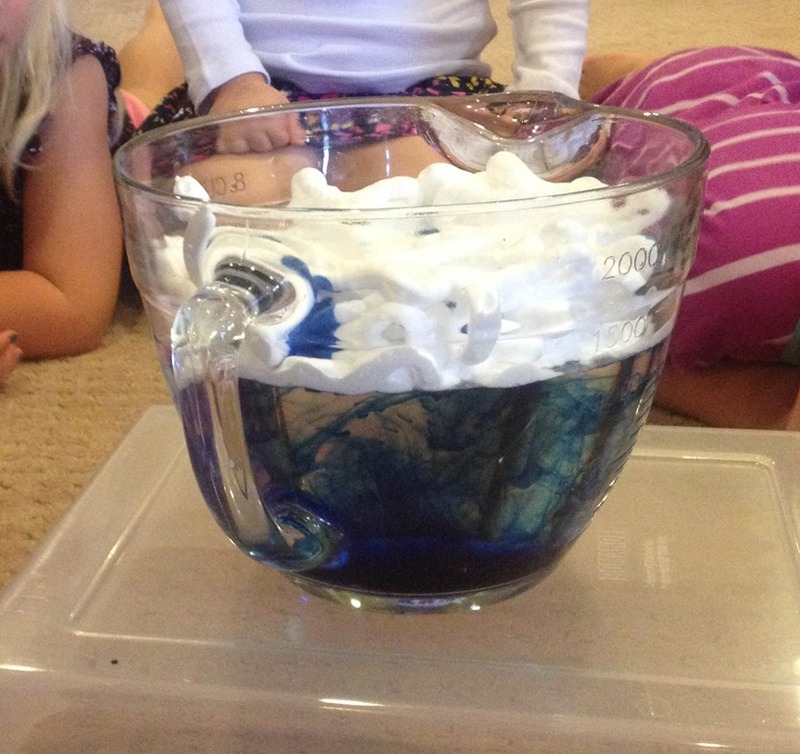 I filled a large mixing bowl with water and then topped it with shaving cream. 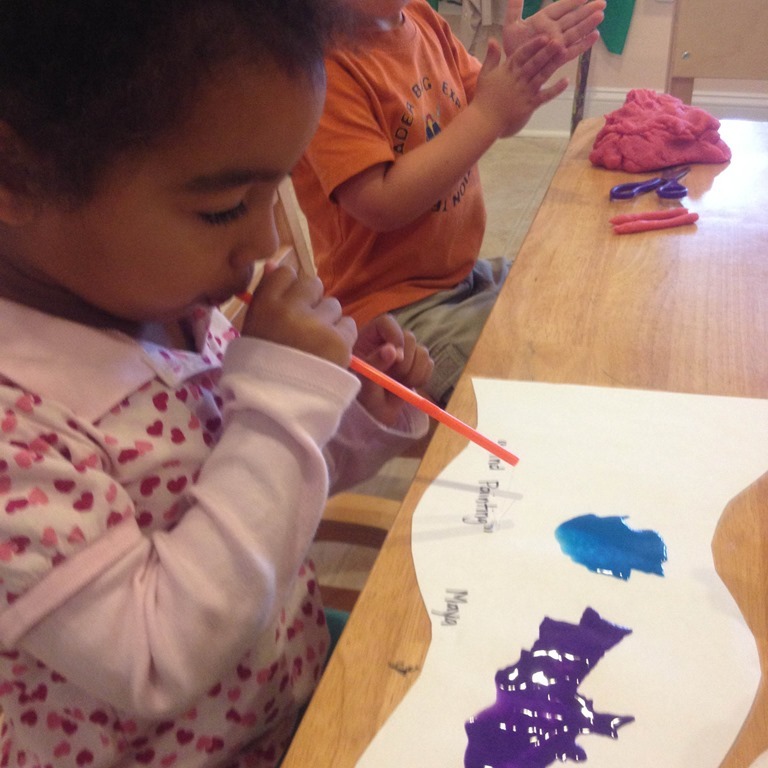 We put drops of blue liquid watercolors into the shaving cream and watched it “rain” before our eyes! 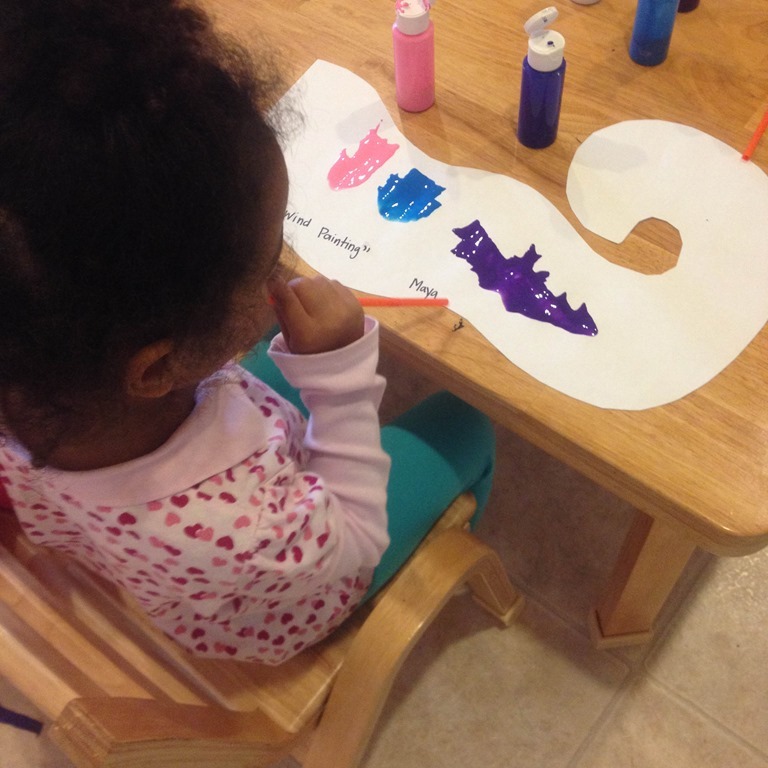 We painted our own rain clouds using cloud cut outs and a mixture of shaving cream and glue for the puffy paint. 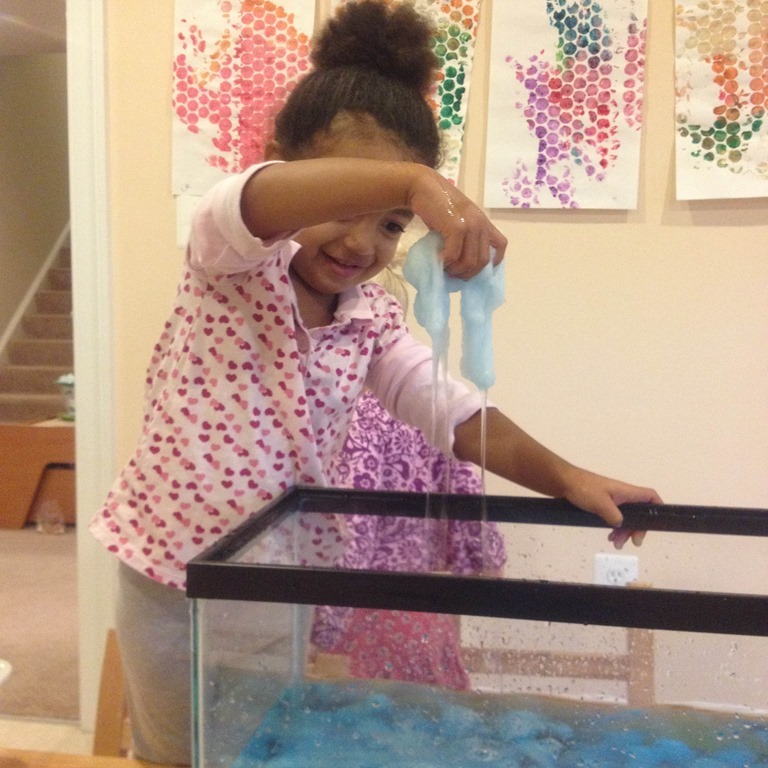 Then they each got a chance to make their own mini rain clouds! 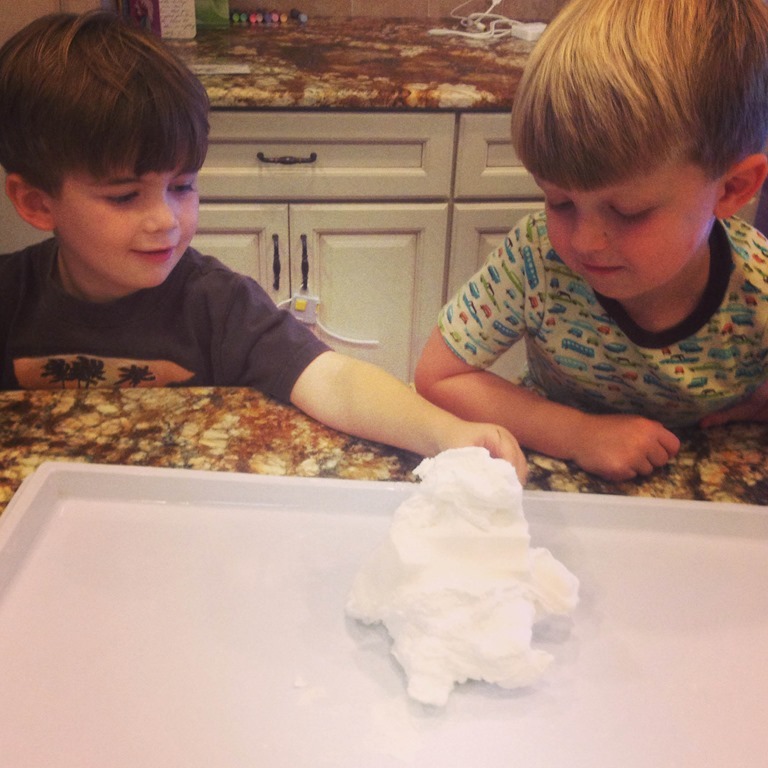 For the first time we did the Ivory Soap Experiment in the microwave upstairs. 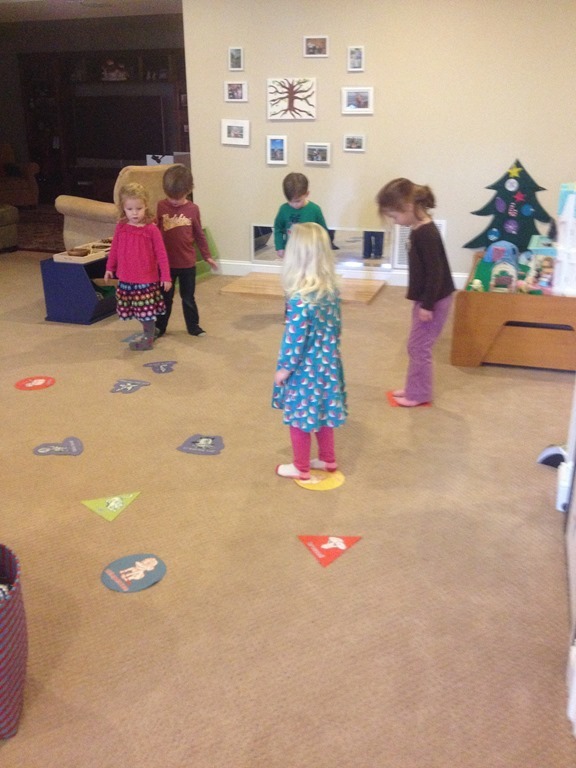 The children went upstairs with Ms. Lori two at a time. 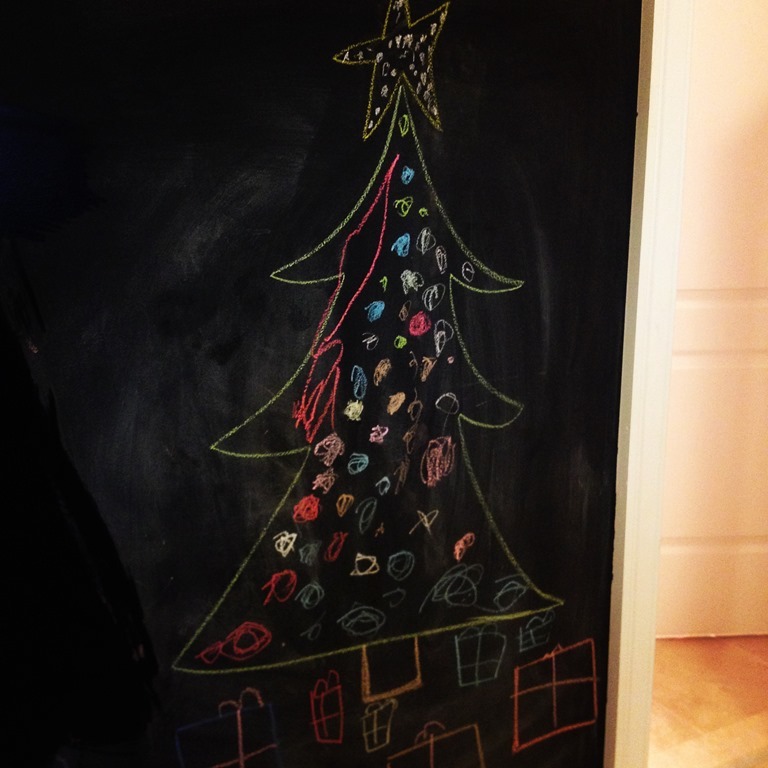 First they drew a picture of a normal bar of Ivory soap. 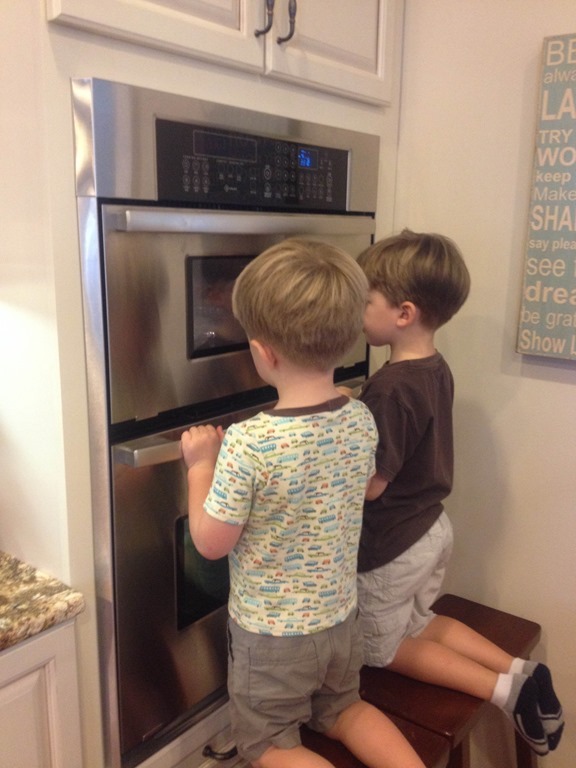 Then they heated the soap up in the microwave for 1 to 2 minutes and watched it expand. 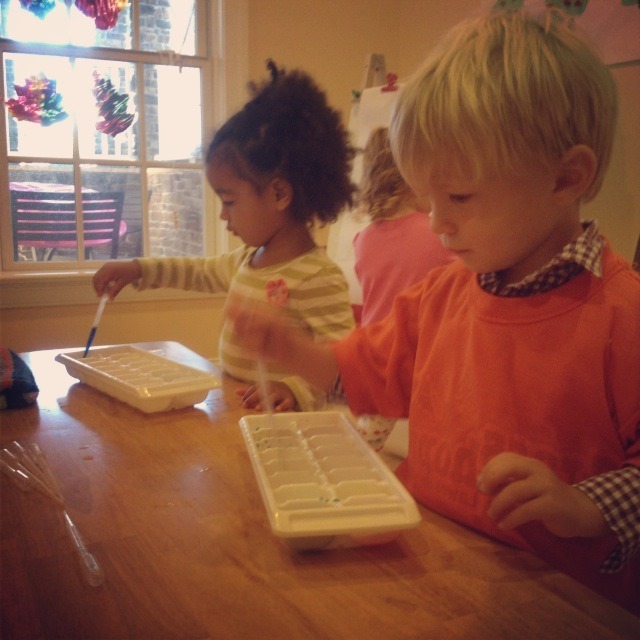 Afterwards they drew a picture of the changed soap in their journals. 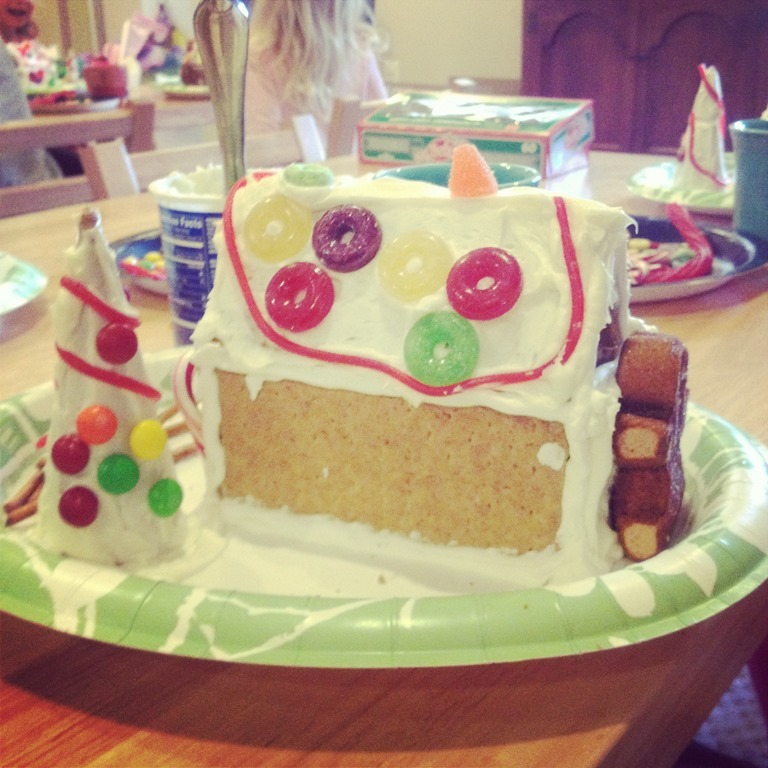 Lastly, we had to feel it and explore it once it had cooled! 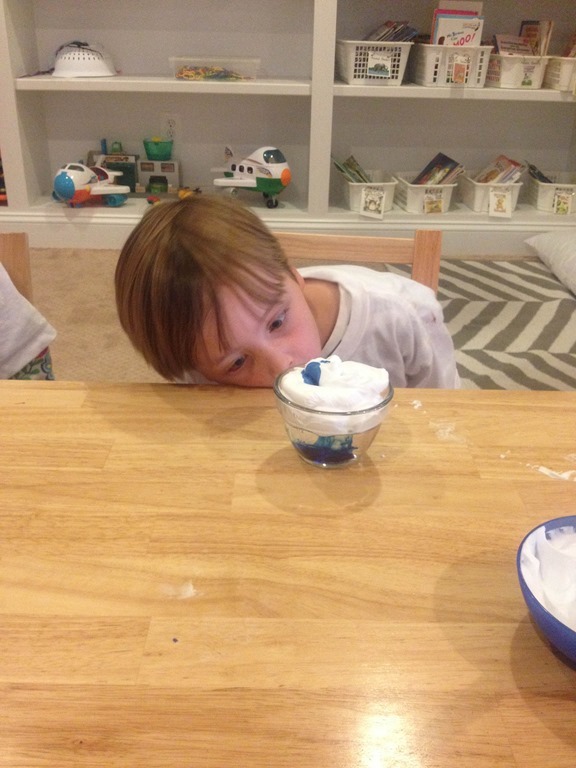 Another science experiment we tried was to make it “rain” in a bowl. 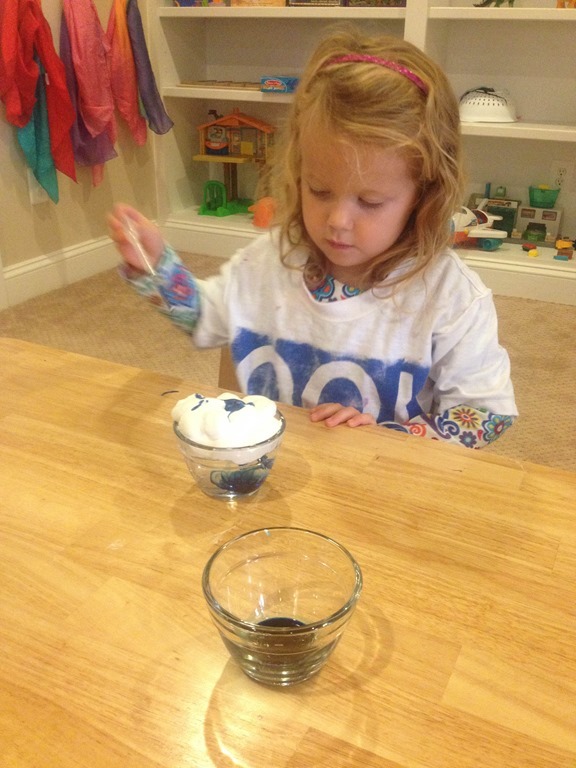 Ms. Lori filled a glass bowl with steaming water. 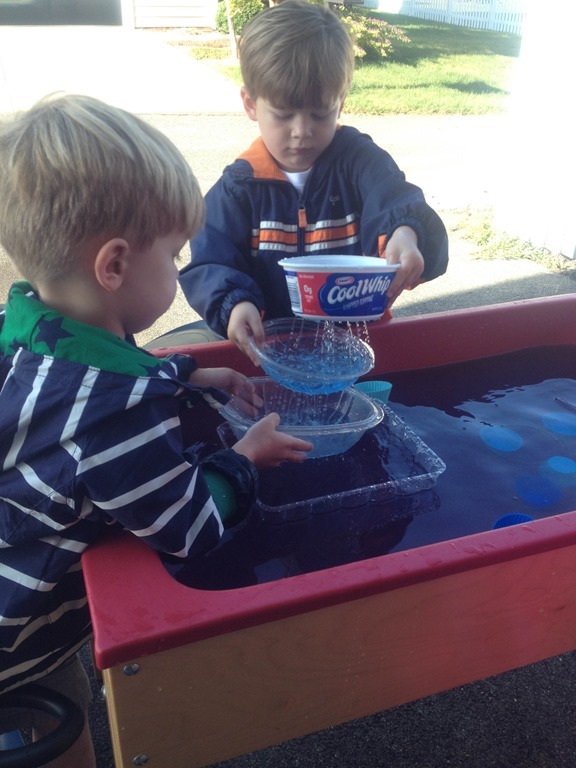 Then we covered the top of the bowl with a plate and lots of ice. 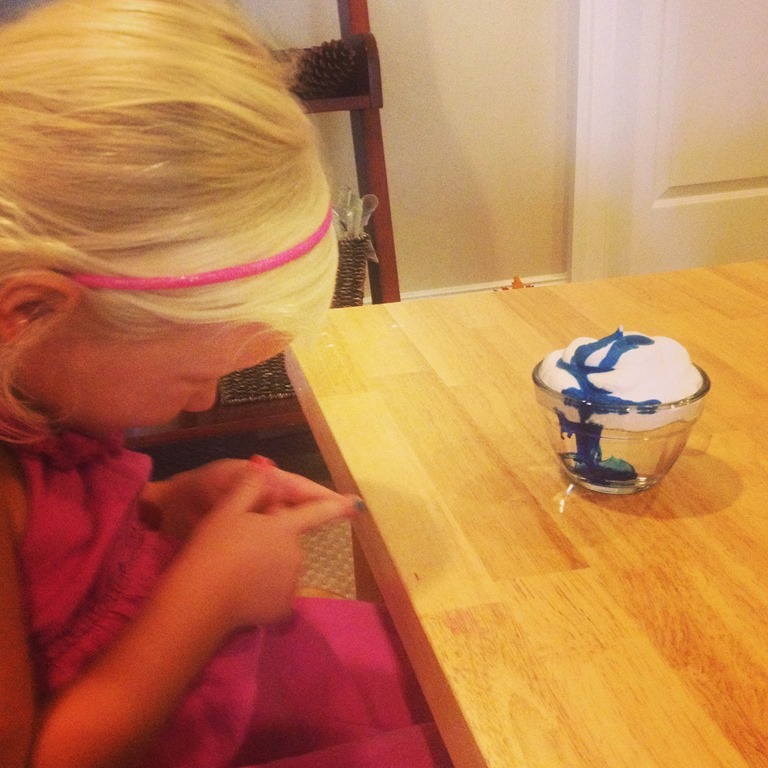 The effect was condensation inside and outside of the bowl. This was a little more of an abstract experiment, but some of the group was really interested in watching the changes take place in the bowl. 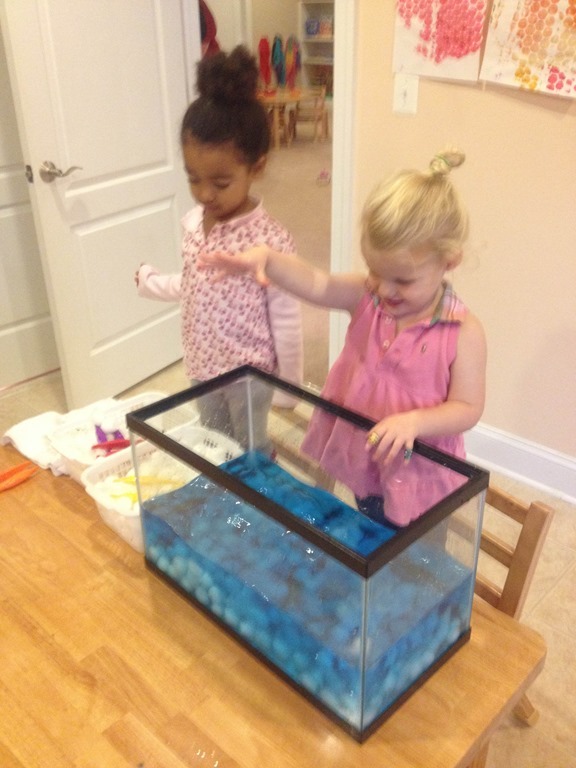 A wonderful rain sensory activity we did was with an old aquarium. 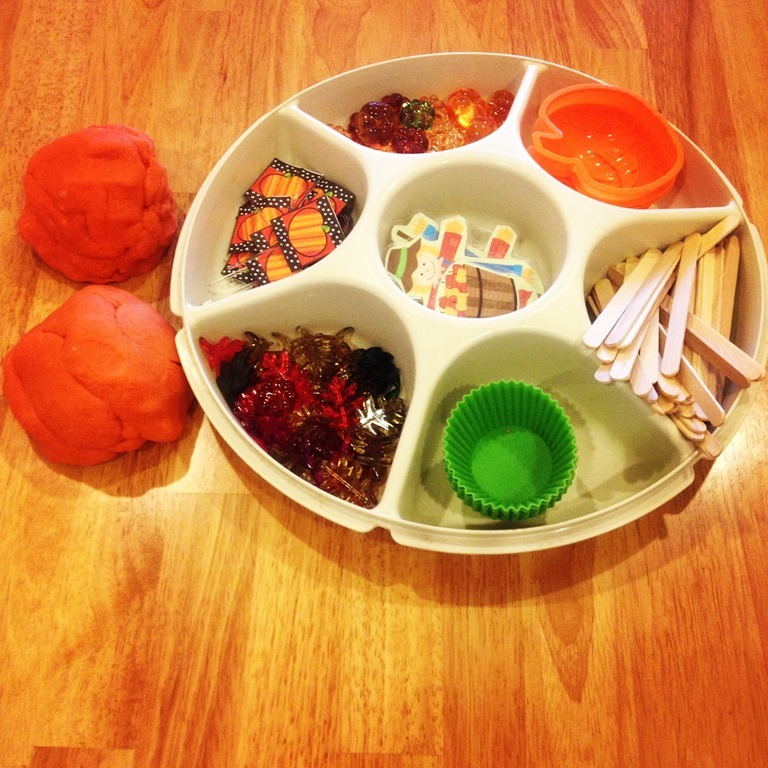 I found this idea from the Teach Preschool website. 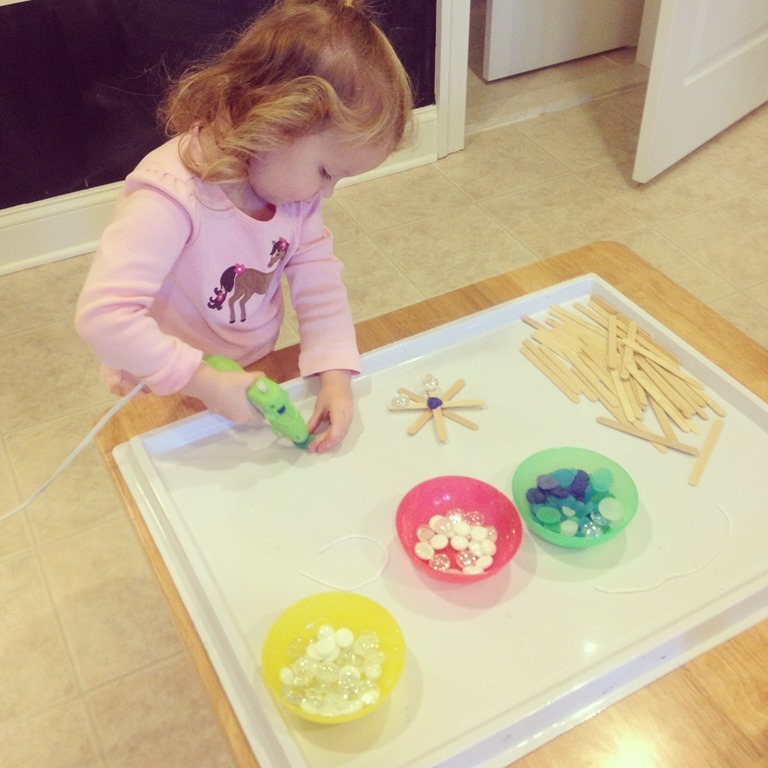 She has so many wonderful and easy ideas to implement. 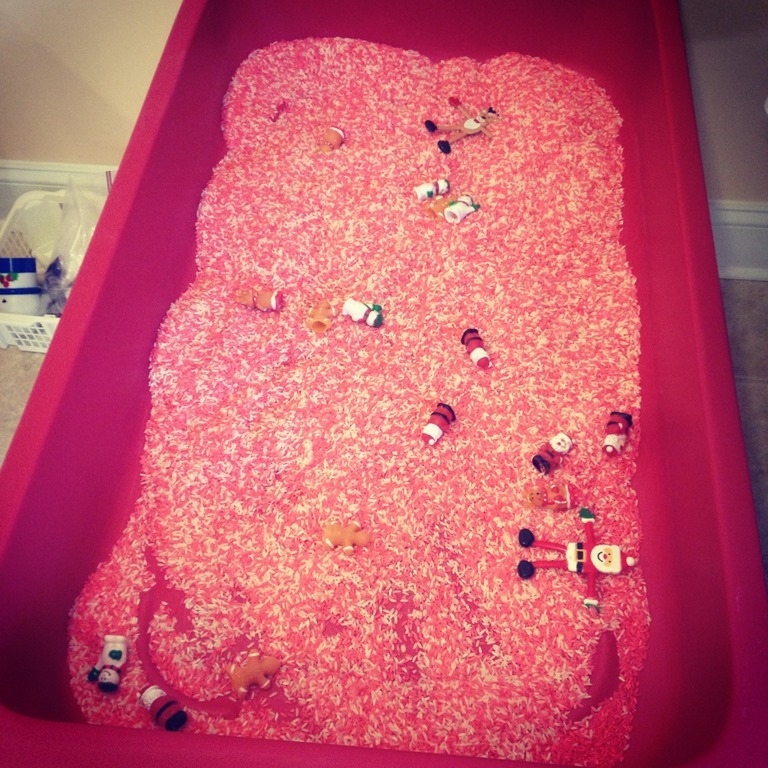 I place a large tub filled with cotton balls and tweezers. 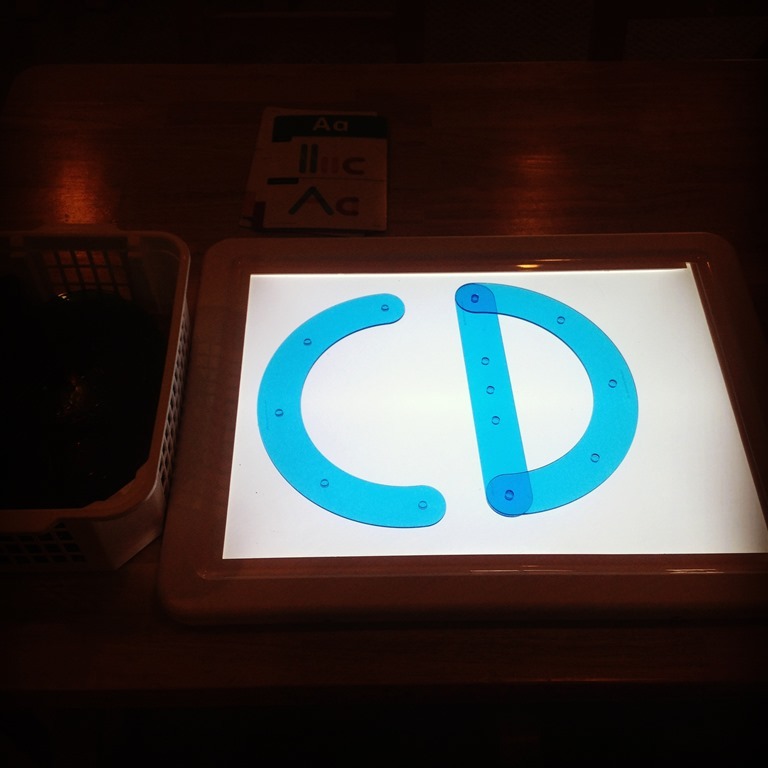 The aquarium was filled with plain water that I tinted blue. 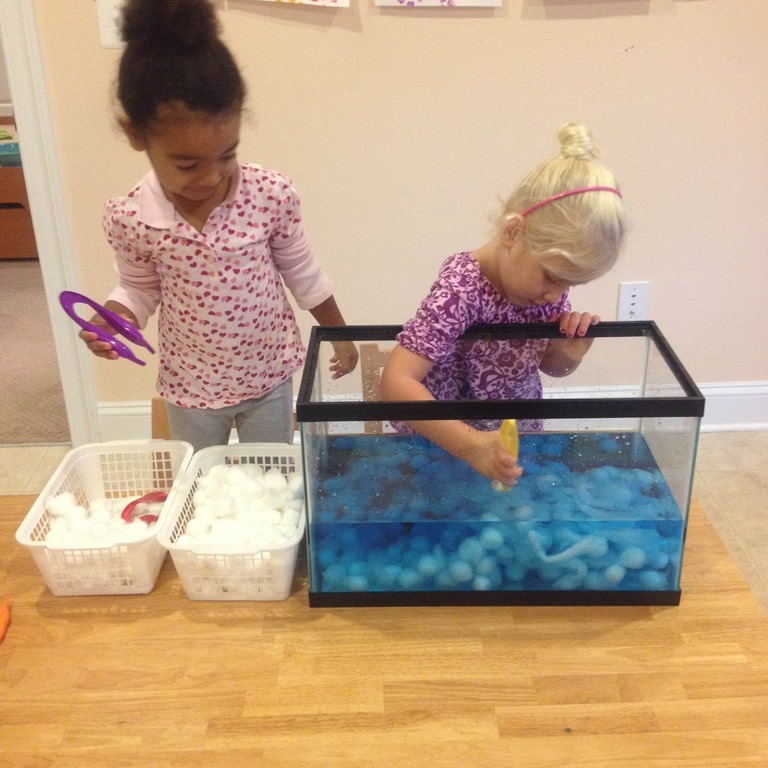 Children could use their hands to move the cotton balls or the tweezers. 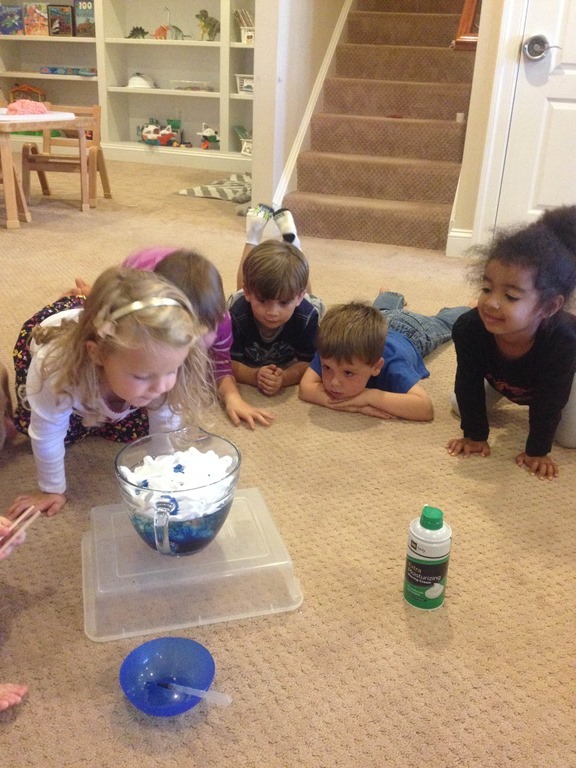 They enjoyed bringing up large collections of the cotton balls and watching it rain over and over again. The series of photos below are some of my favorite pictures from this whole weather study. 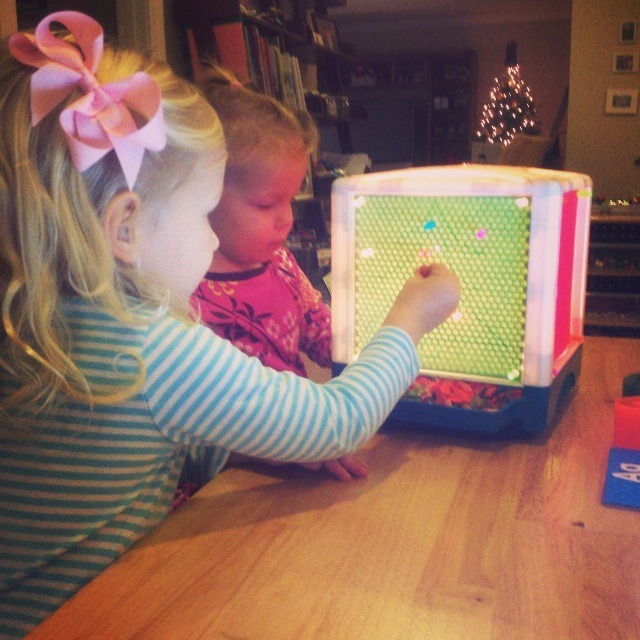 Such hands on learning, and focused play! 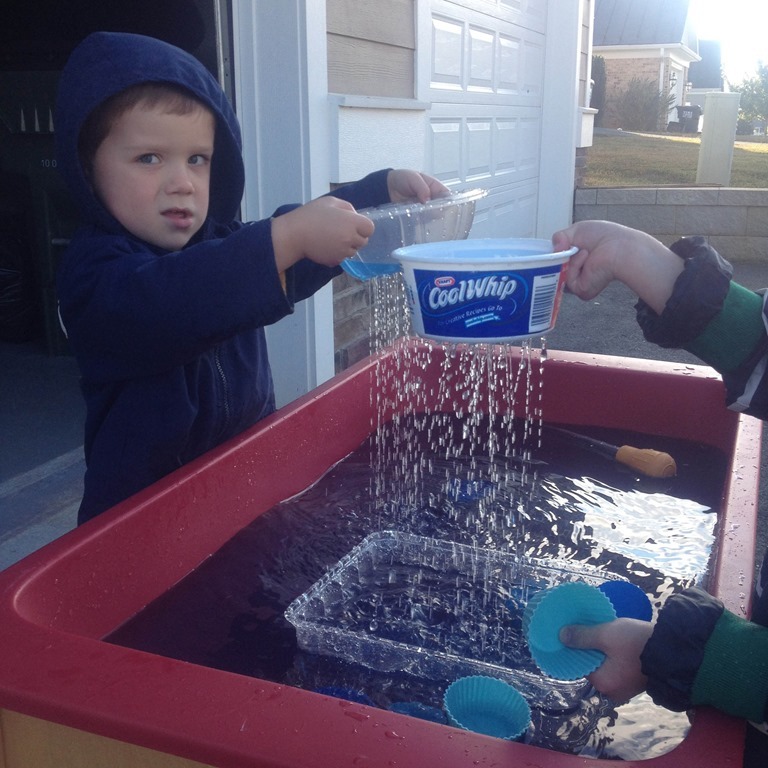 We also set up a rain station outside in the sensory tub. 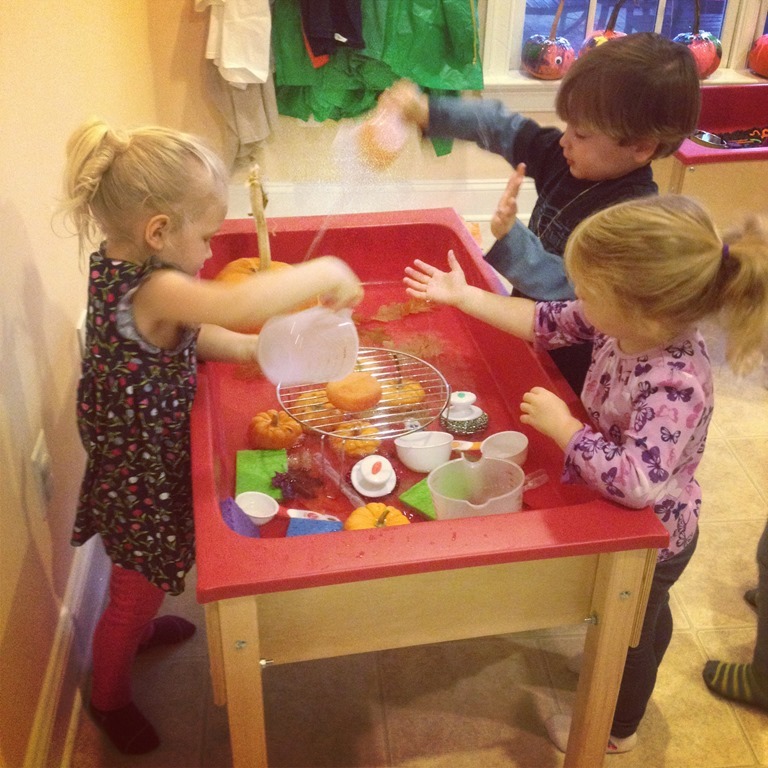 Thank you parents for all of the clear lids. 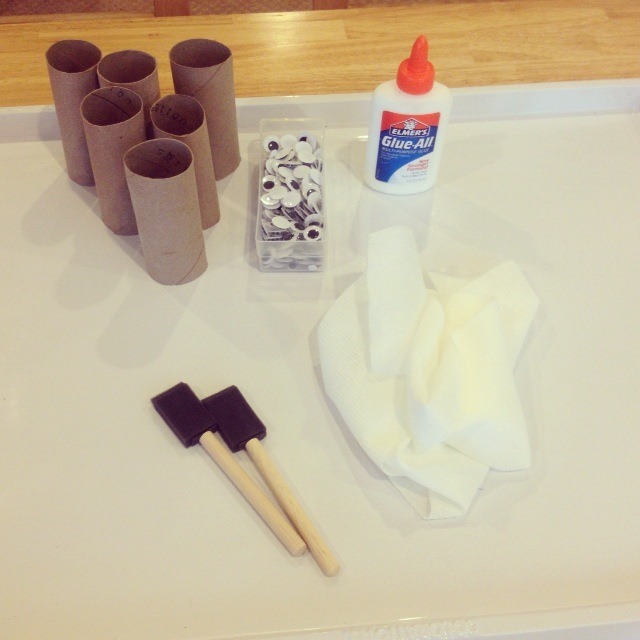 I used one of Chris’ tools to hammer in lots and lots of small holes in the plastic lids. 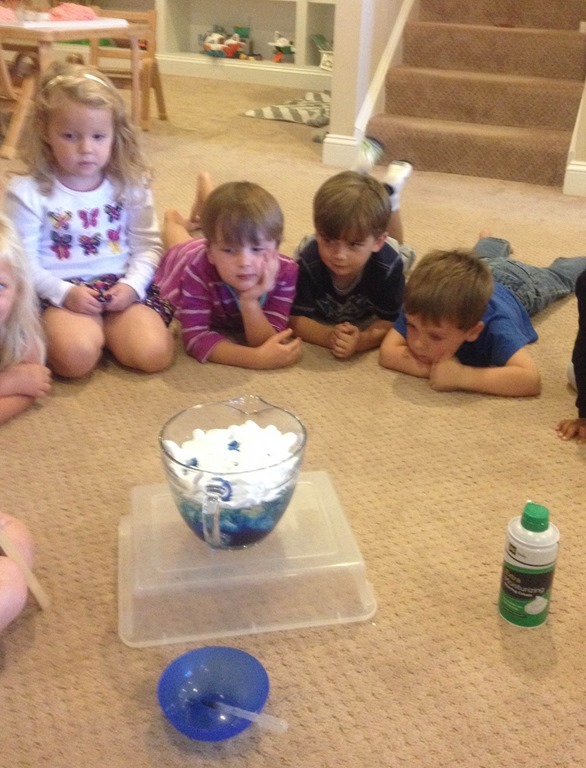 The children loved experimenting with the tubs, making lots and lots of rain. L and L had a lot of discussions about large rain clouds, and if you had one cloud on top of another cloud how much rain will fall. 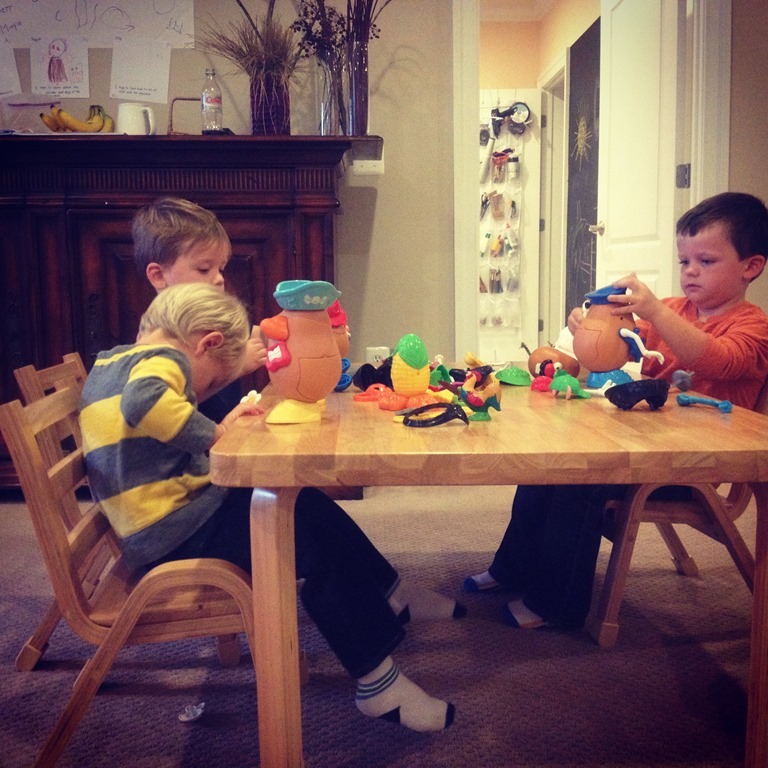 Love their thinking! 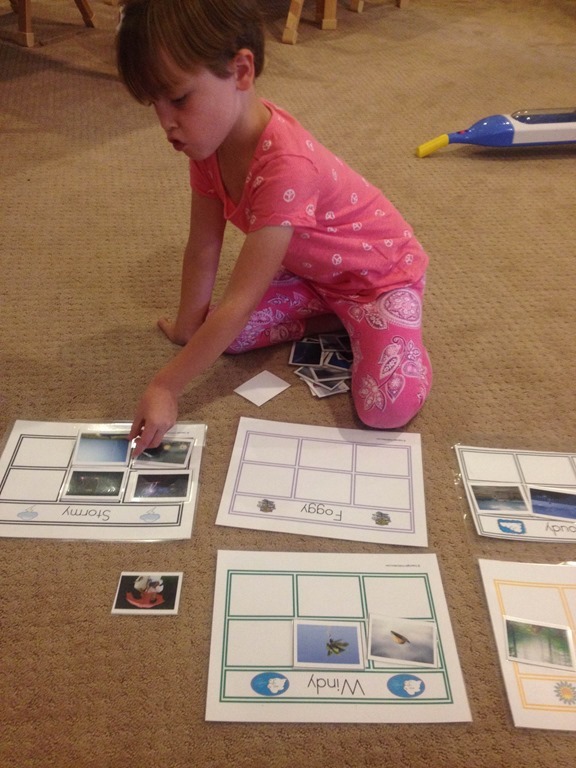 I didn’t capture a lot of pictures, but I had the class sort picture cards into different weather categories: stormy, foggy, windy, cloudy, and sunny. 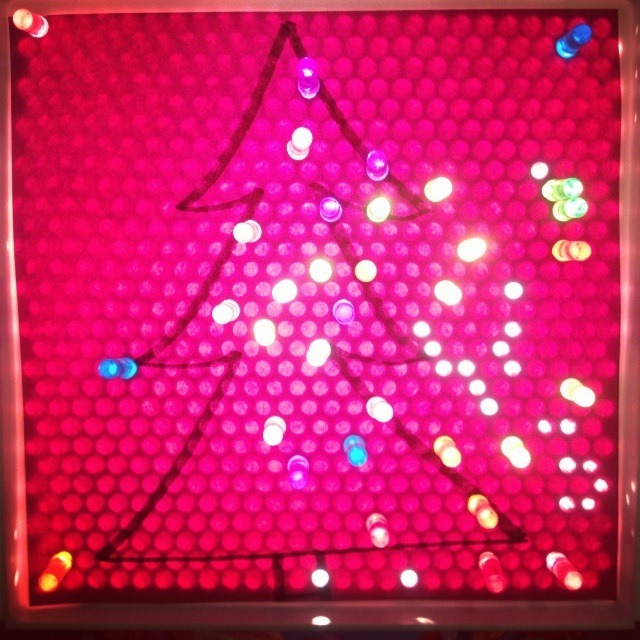 We also made a beautiful rainy weather art project. 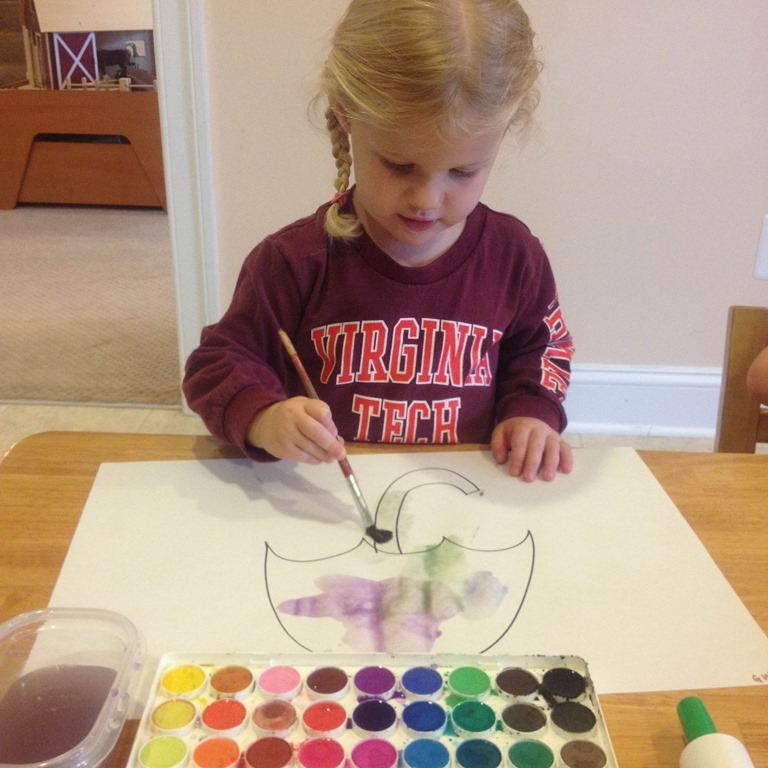 First the children painted with watercolors onto a outline of an umbrella. 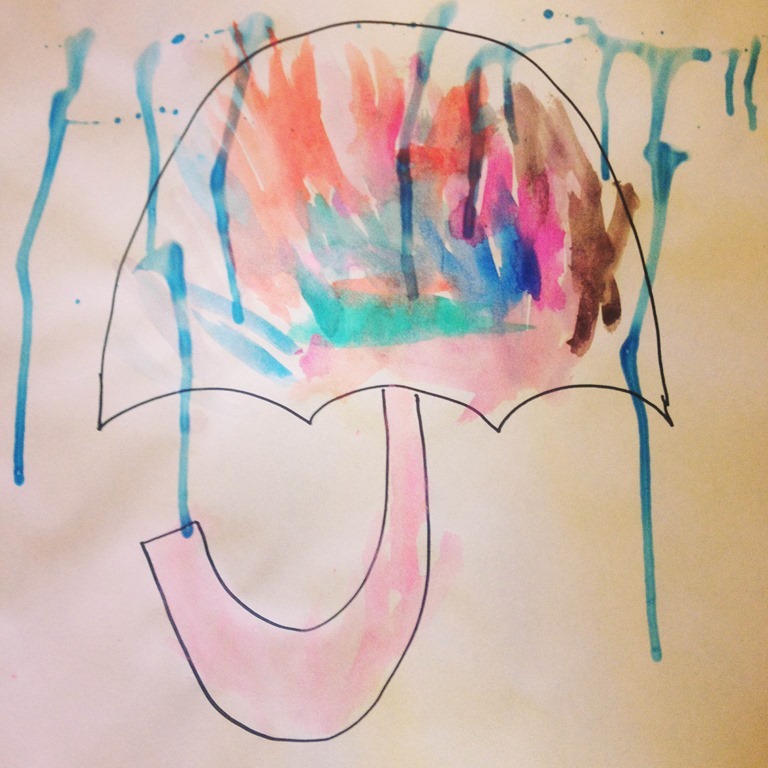 After the picture’s dried I made a mixture of water, glue, and blue coloring to create a rain effect over the umbrella. 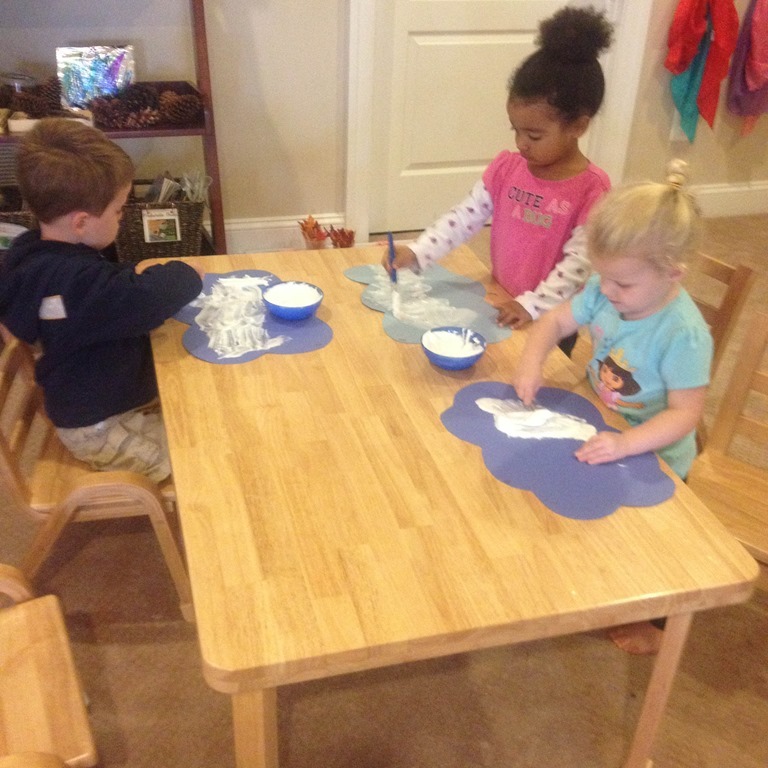 Each child dropped the blue glue on the top of their umbrella and then held the paper upright to cause the glue to drip down the front of their picture. 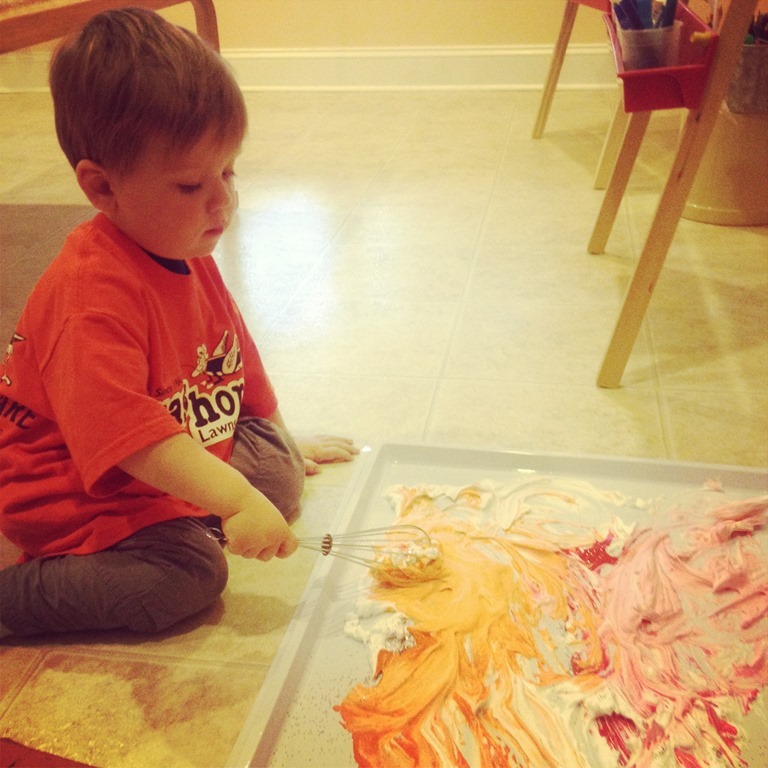 We also did wind paintings with straws and watered down paint. 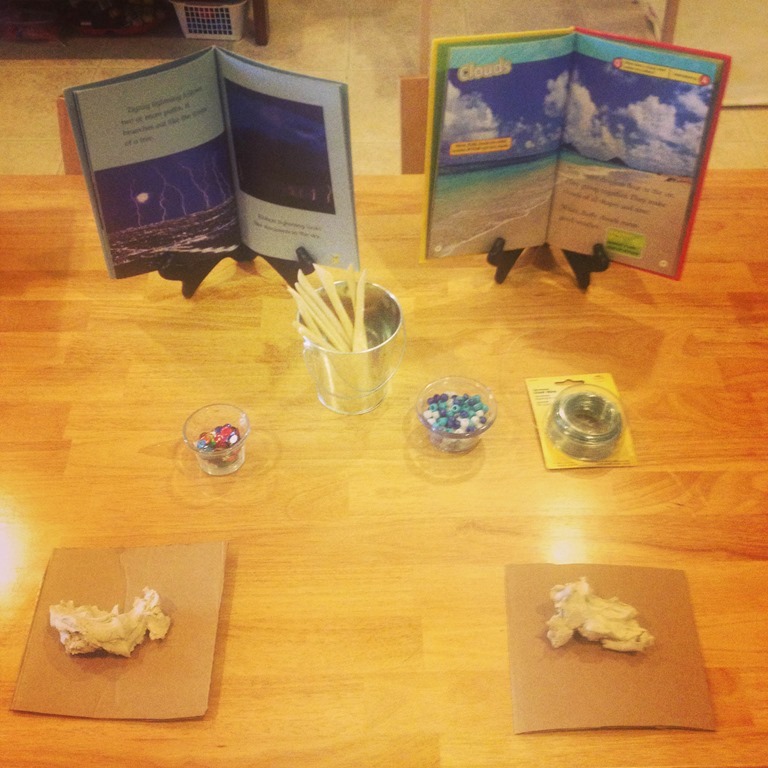 One of our last provocations was a clay prompt. 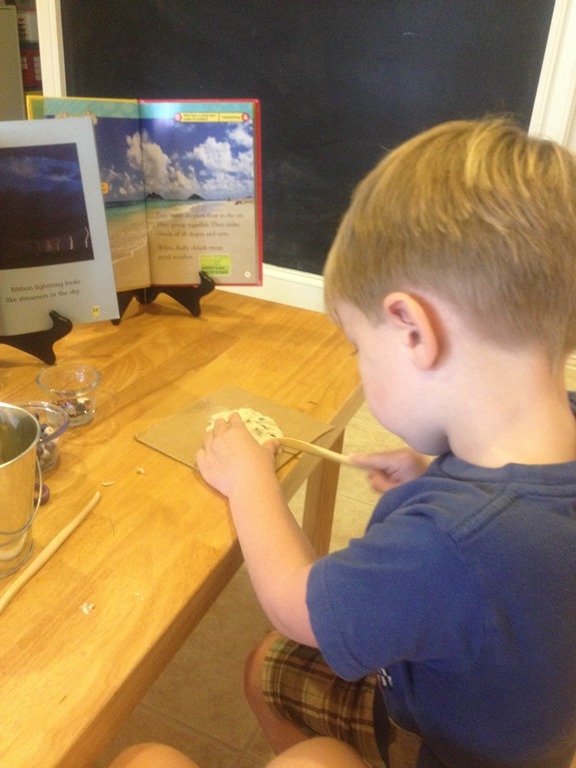 I gave each child a small amount of clay, wire, beads, gems, and pictures of clouds and storms. 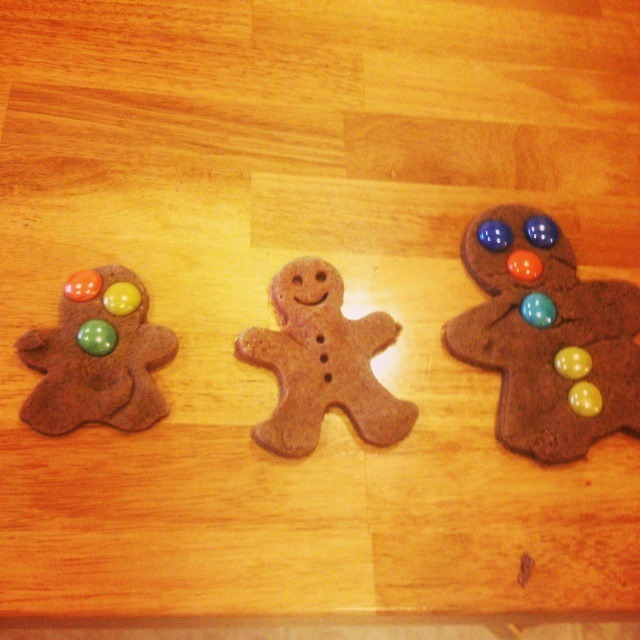 The results were fabulous. 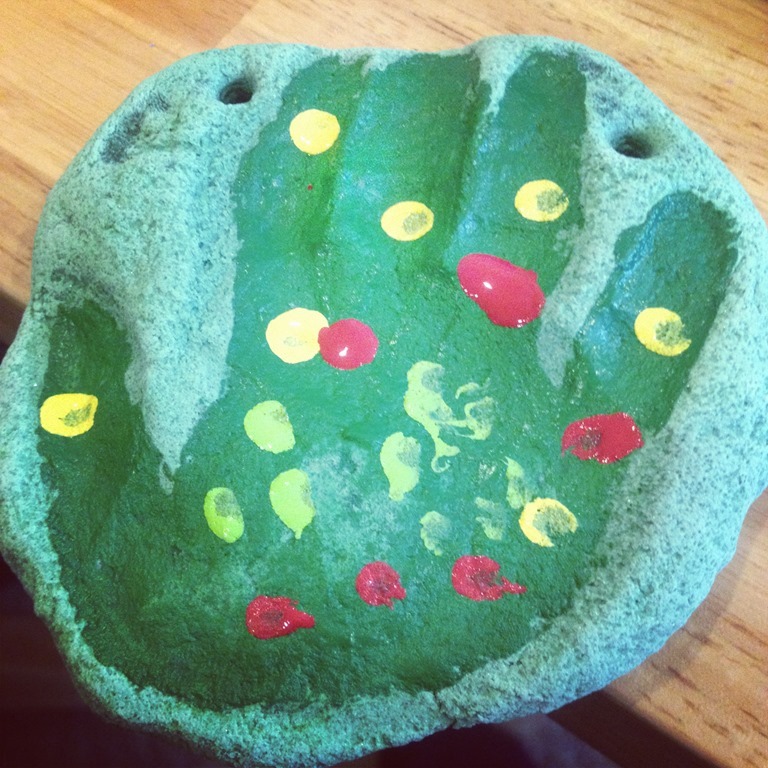 I had each child describe what they created after they were finished with the clay. 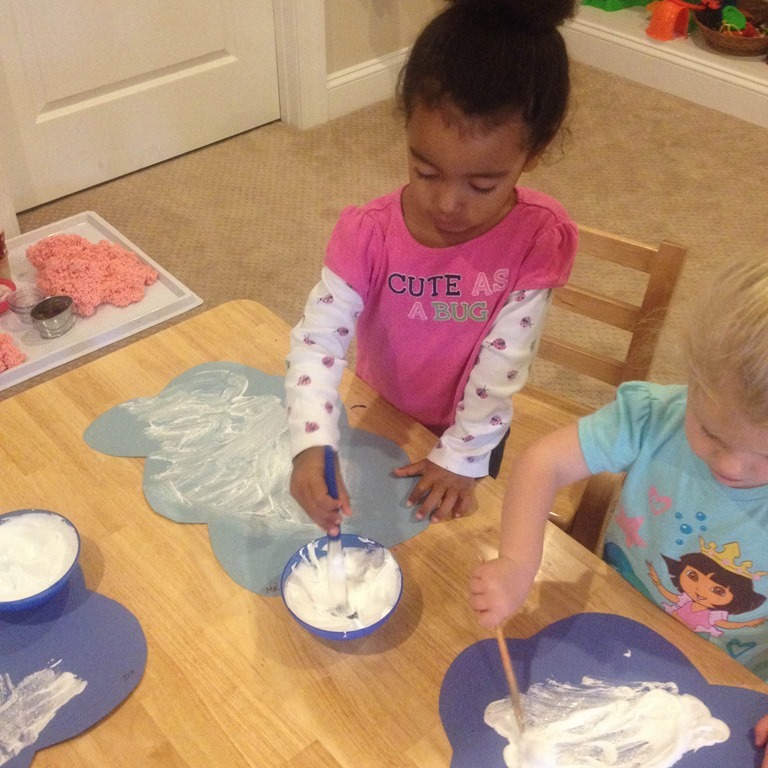 Categories: education, home based learning, play based learning, preschool, reggio emilia inspired, sensory play | Tags: clay, cloud, play based learning, play based preschool, playmatters, preschool science, rain, reggio inspired, science, science experiments, storms, weather, weather study, weather unity | Permalink. 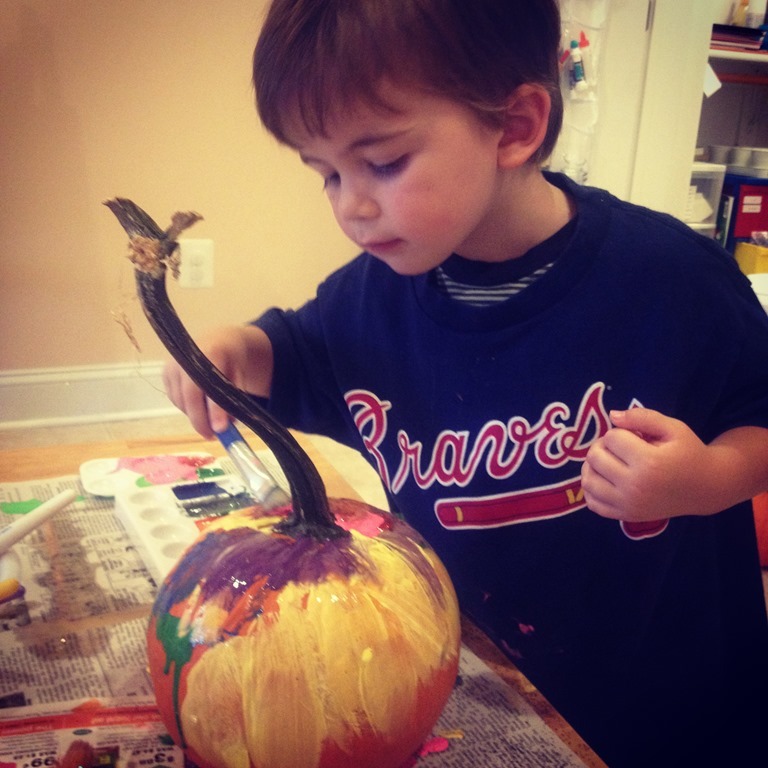 The classroom has been filled to the brim with Halloween and fall inspired learning this month! 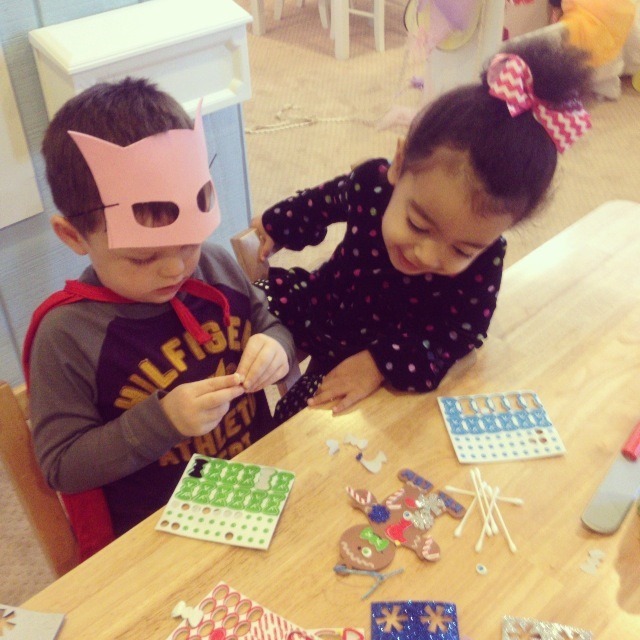 This post is packed full of pictures from our classroom, and all of the activities we have been working on. 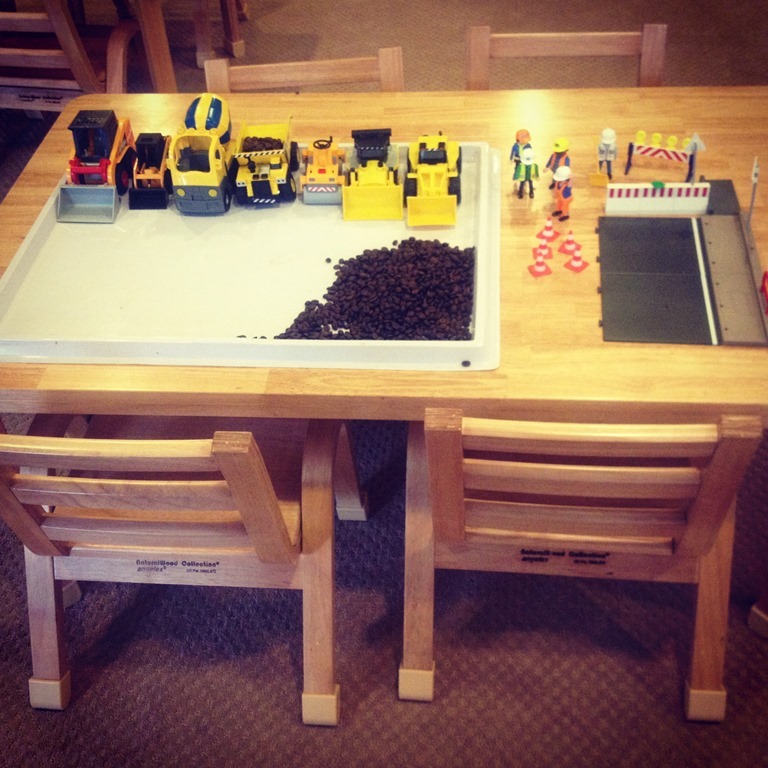 Each week I try to lay out different “Invitations to Play” on our classroom tables. 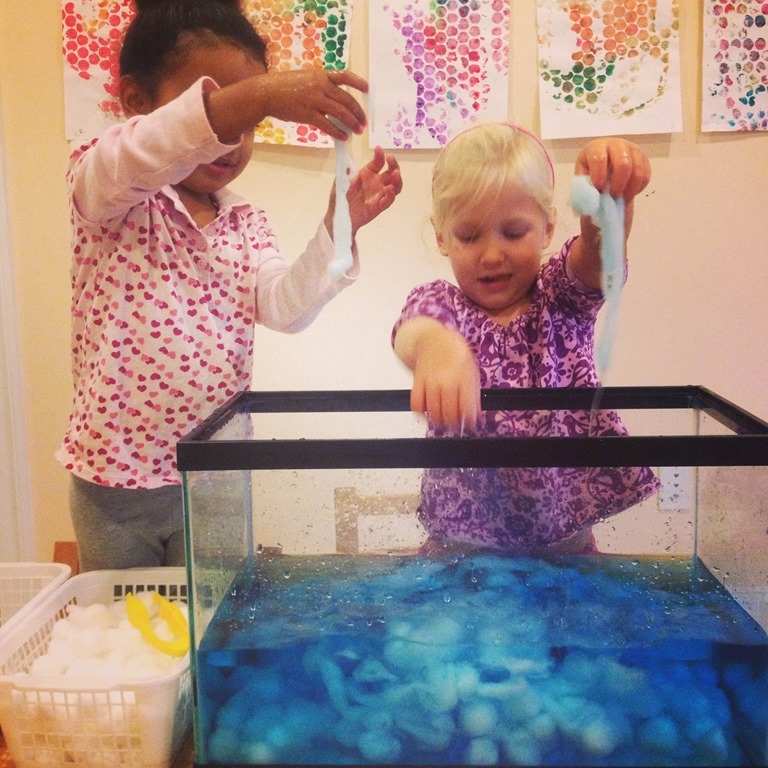 The activities may be a type of game, art, craft, or sensory experience that is tied into our classroom discussions. 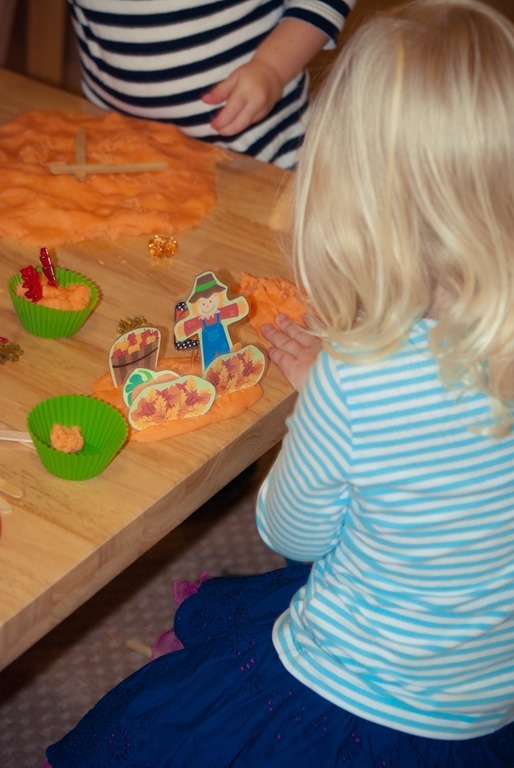 This months we had felt pumpkins with matching cards. 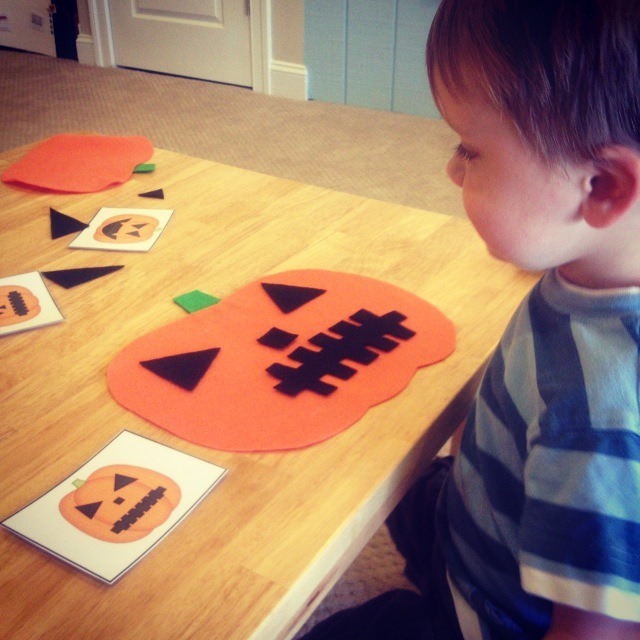 Children pulled a card and then tried to find the matching pieces of felt to build their pumpkin correctly! 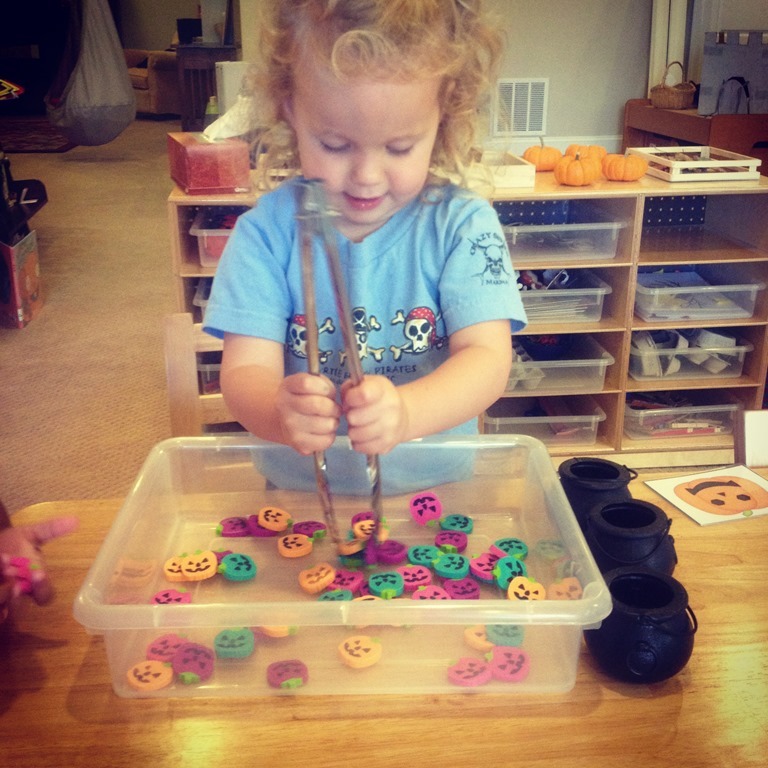 We have also been doing a lot of activities to build up our fine motor strength. 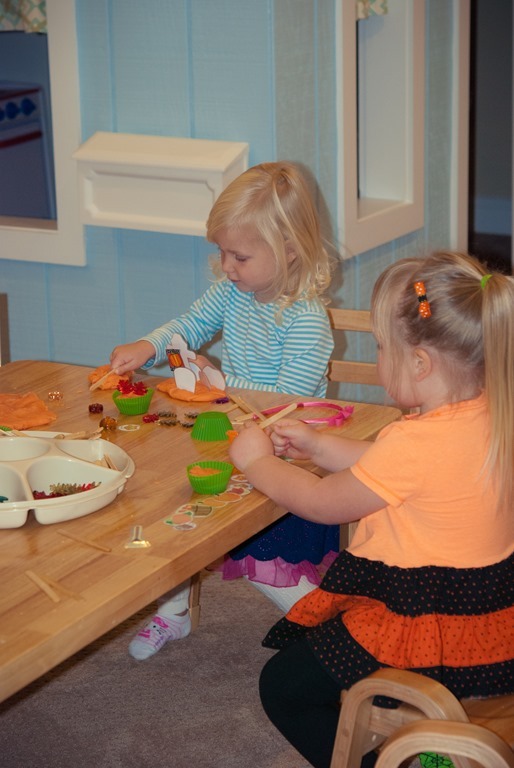 One of the table invitations was grabbing and squeezing pumpkin erasers with tongs and placing them in the “witches cauldrons.” This has been a classroom favorite! 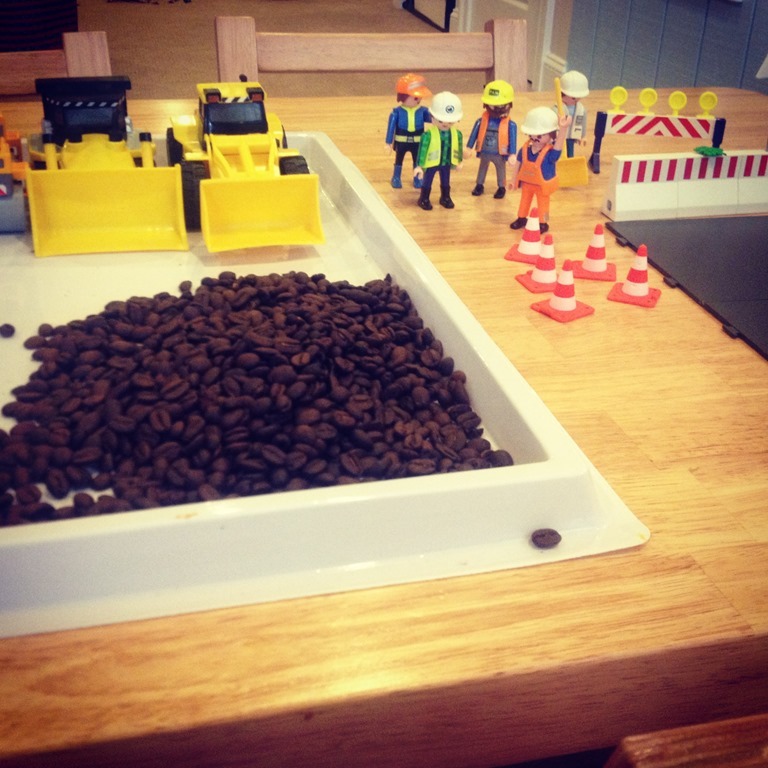 This “invitation to play” was on our tables a few weeks ago: coffee beans, trucks and differs, playmobil construction men. 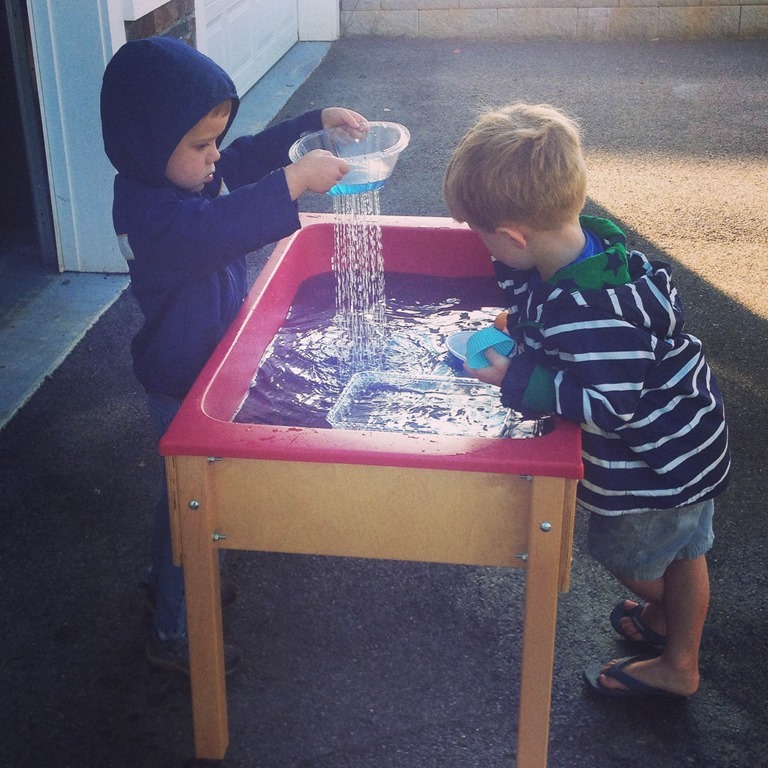 We love trucks and cars, and I am trying to find ways to incorporate car play into the classroom. Mr. 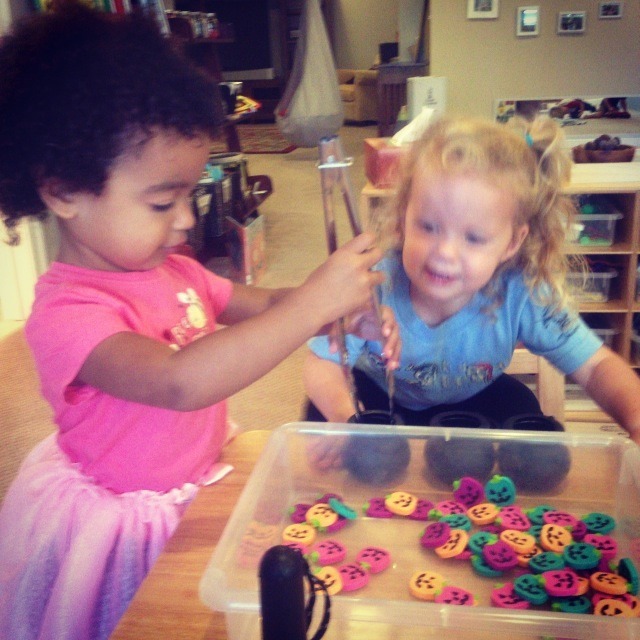 Potato head is always fun and great fine motor practice too! 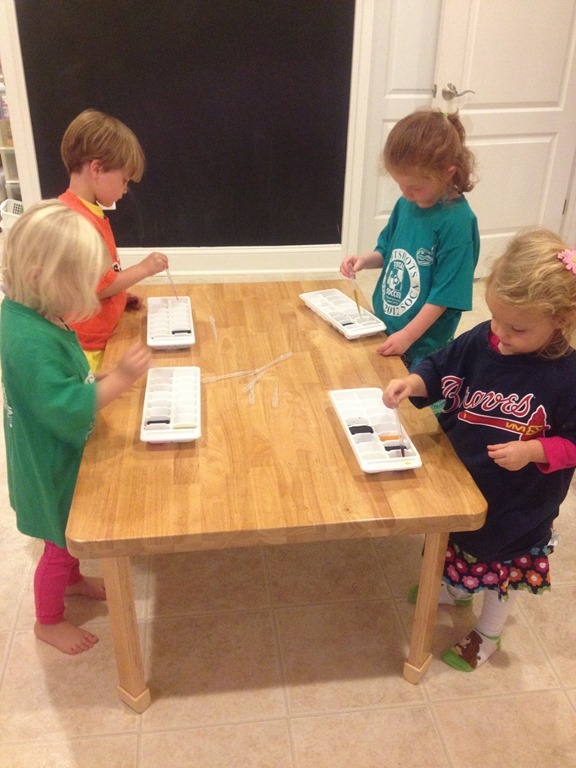 Squeezing spiders on the spider web and fall themed toothpicks pushed into Styrofoam. 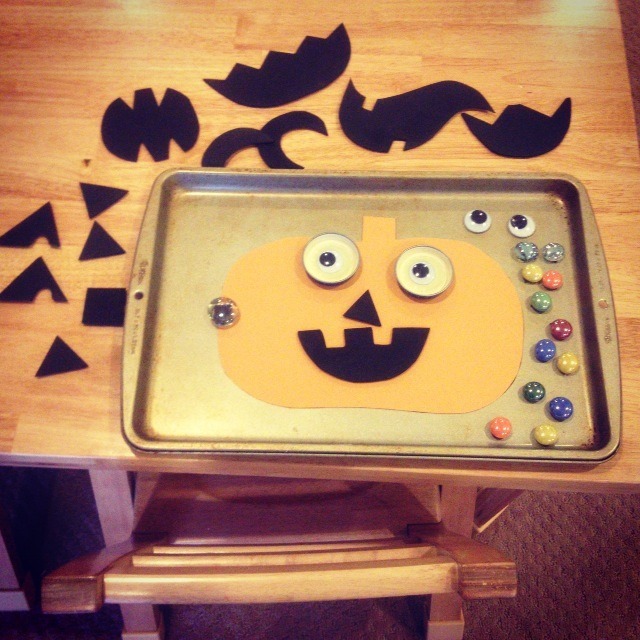 I also had jack o’ lantern faces on the large magnetic board this month too! 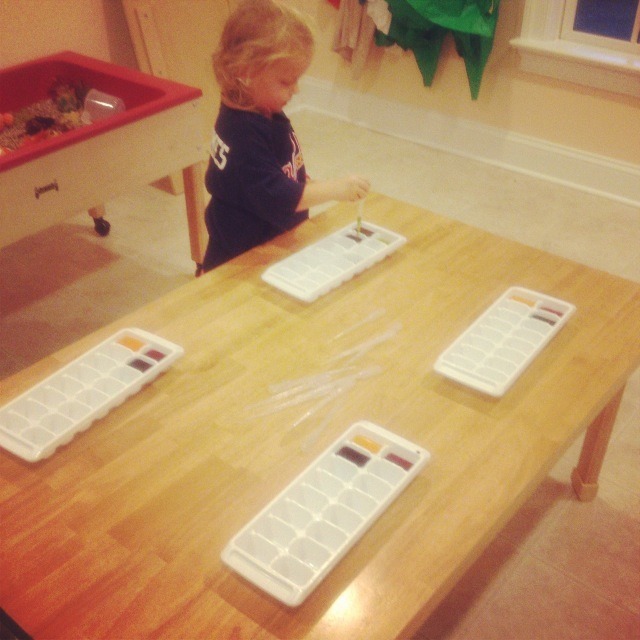 Counting practice was on the tables last week. 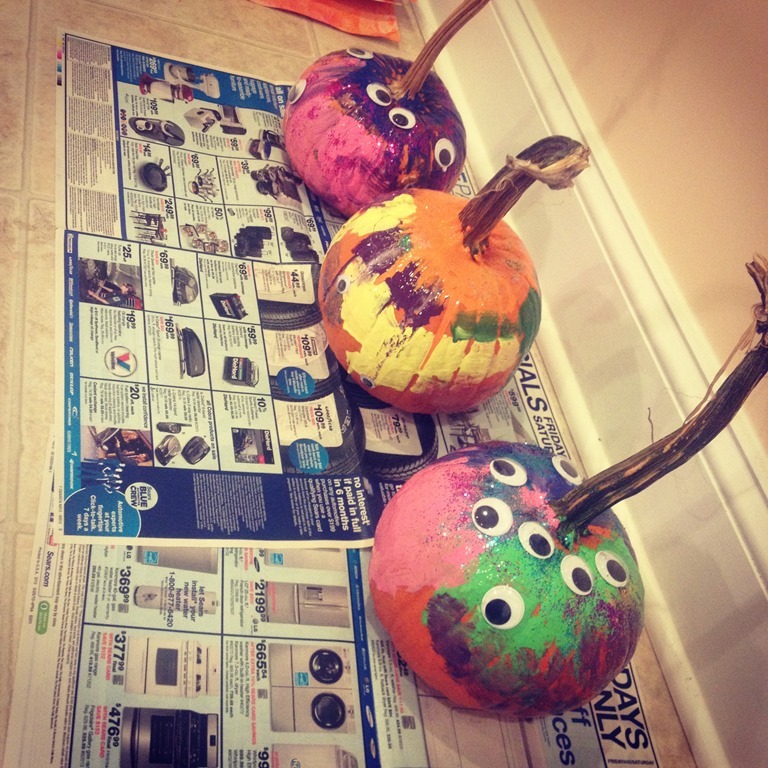 I simply drew a few pumpkins with numbers inside. 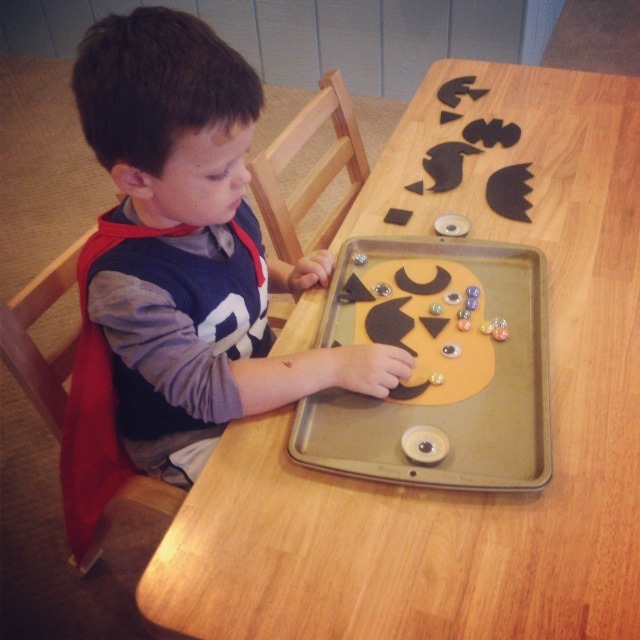 Children counted out the correct number of ghosts and placed them in their pumpkin. 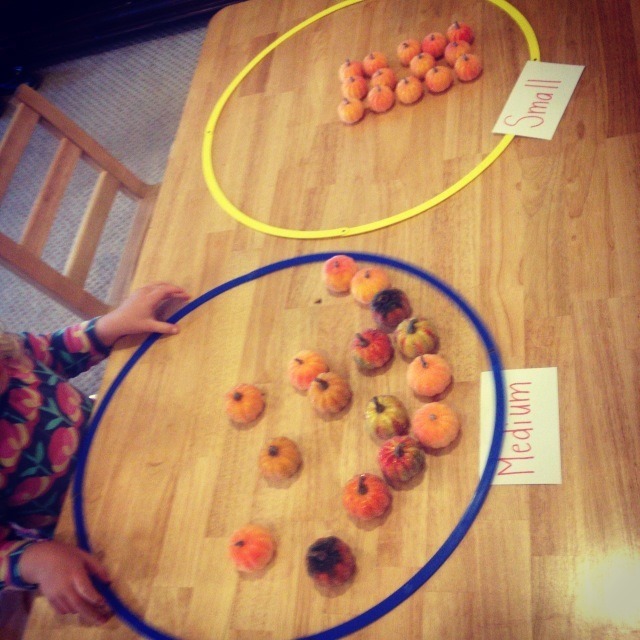 We have also had a few more discussions on sorting objects. 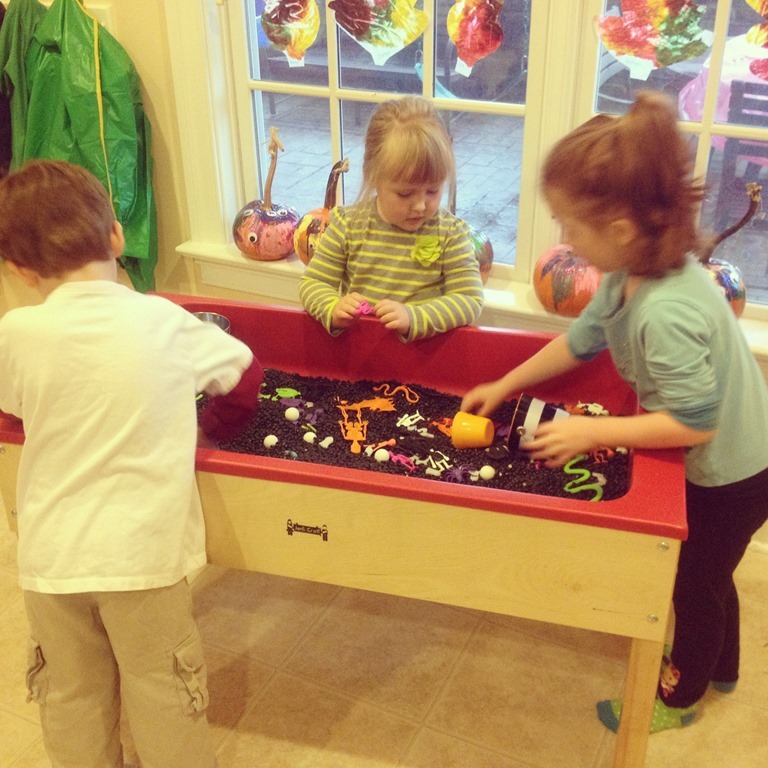 This month we sorted our pumpkins into Big, Medium, and Small. 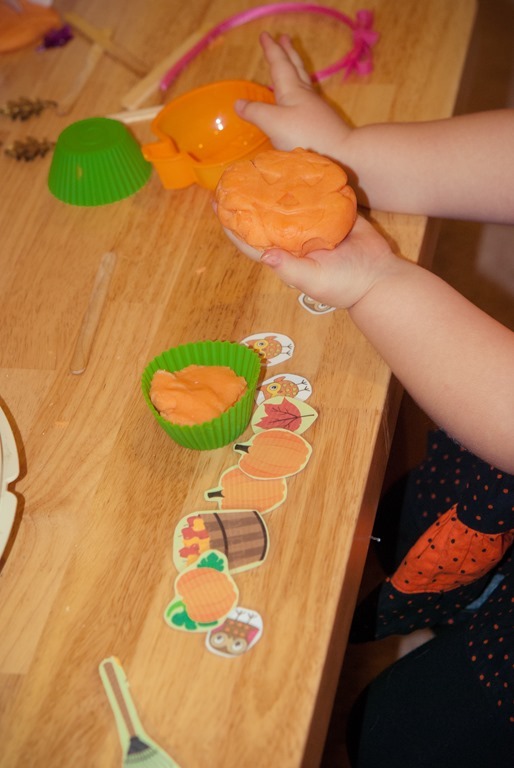 L realized that if she pushed her play dough into the jack o lantern, it would imprint on to the dough! 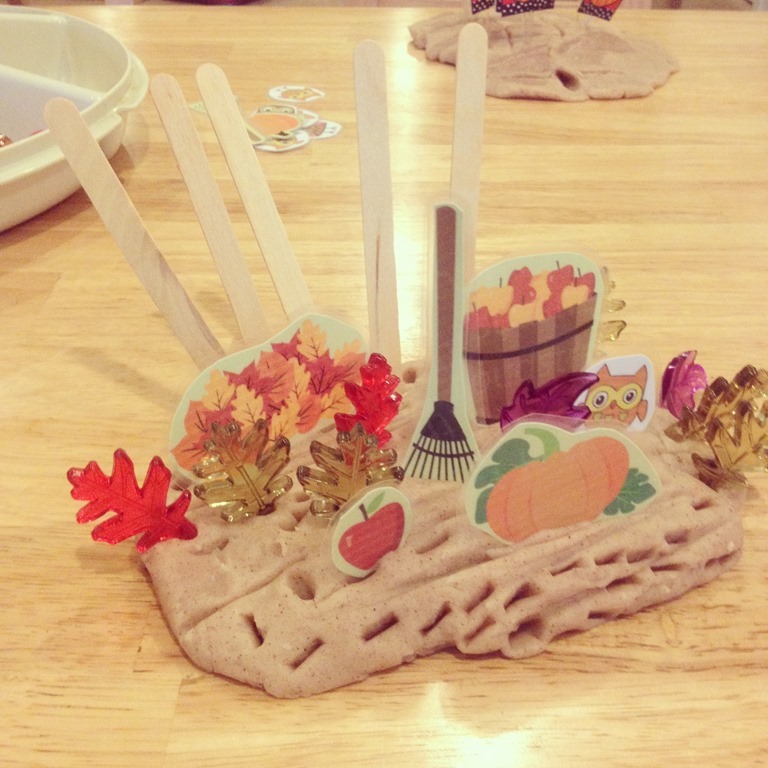 C spent a great deal of time creating a little fall scene with her play dough. 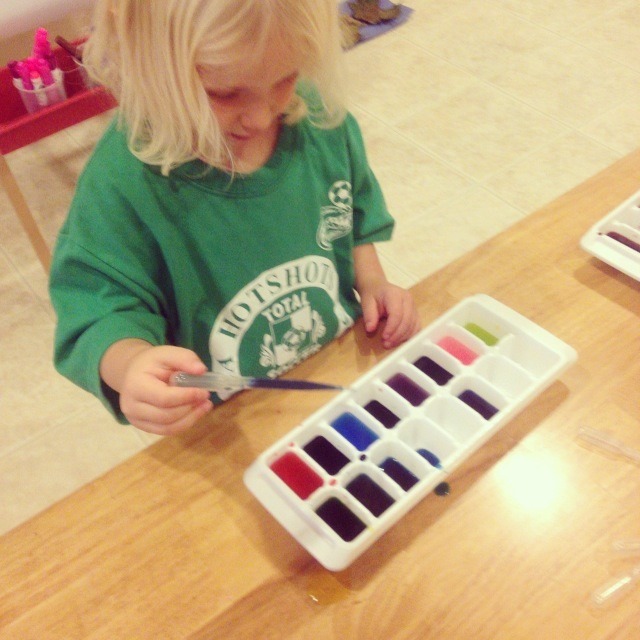 E was inspired by the craft sticks. 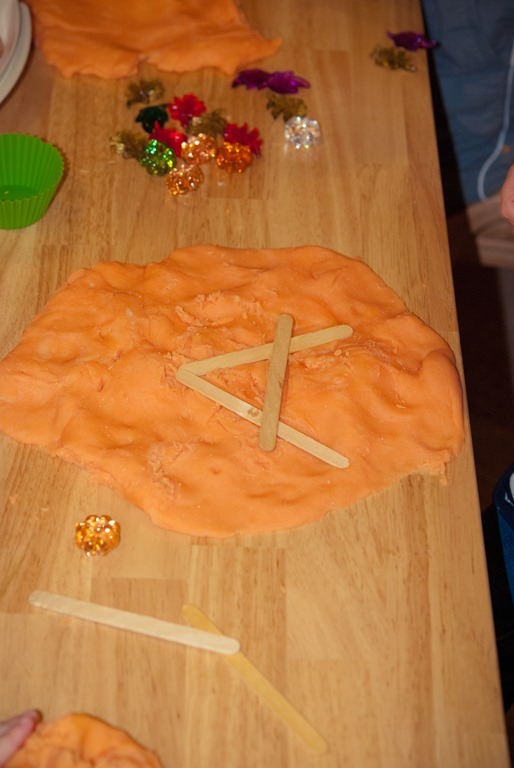 First she was making Xs and then she began to make more letters with the sticks in the dough. 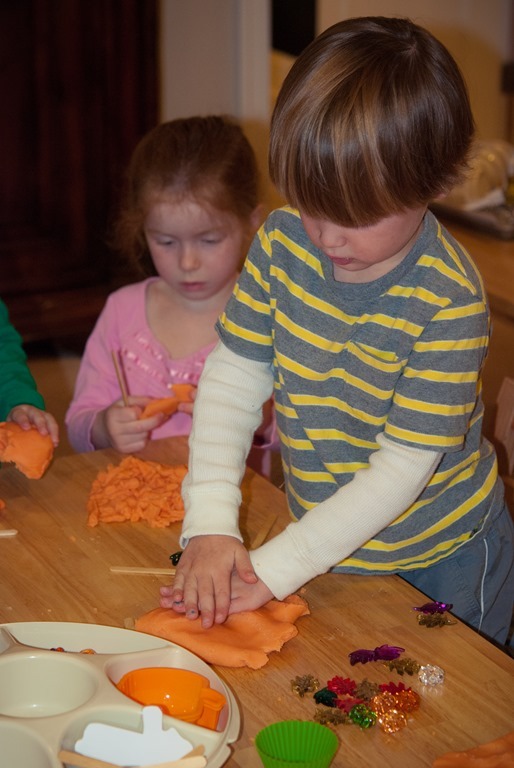 M and P spent most of the time making “pumpkin popcorn.” They would roll the dough into a long snake and then cut it apart with the craft sticks. 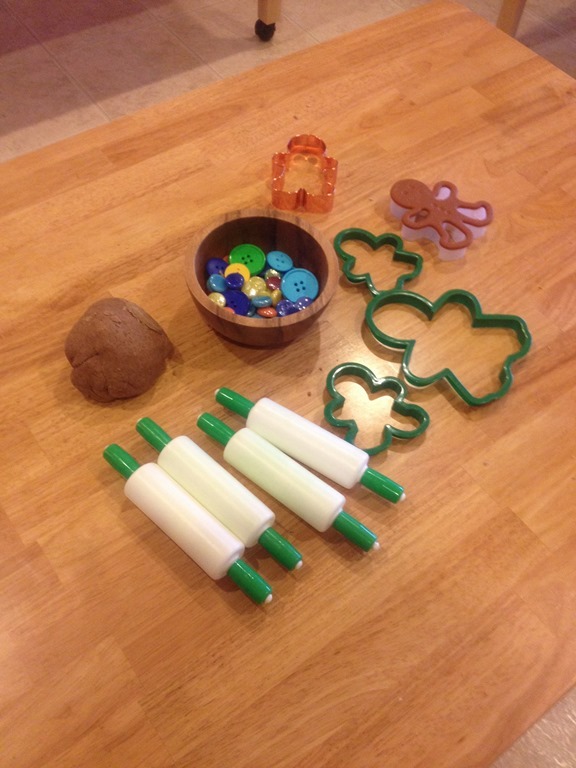 Below are more pictures of different play dough work I have found around the classroom…. 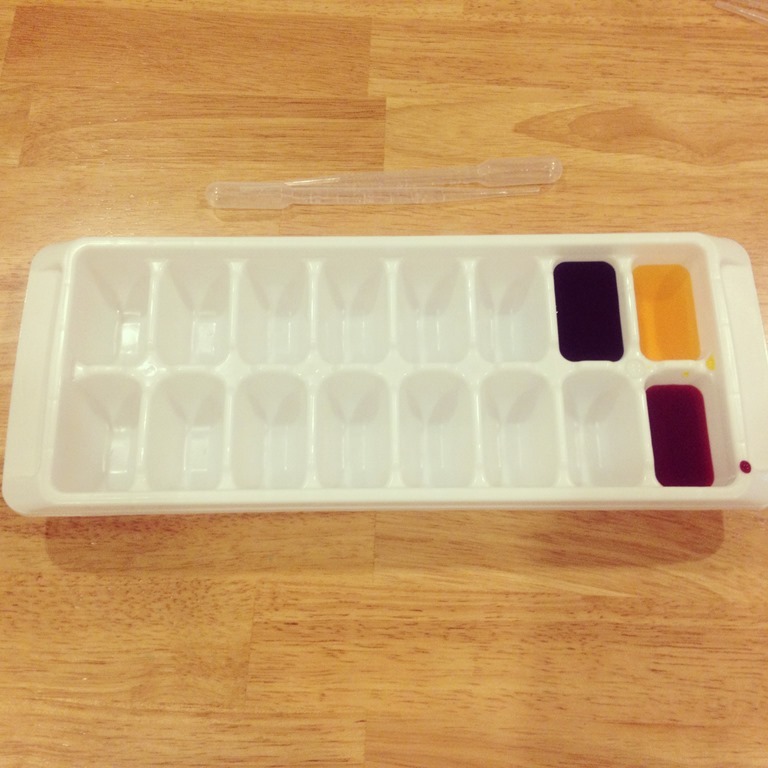 I am going to expand this learning next month by introducing color mixing with paint trays. 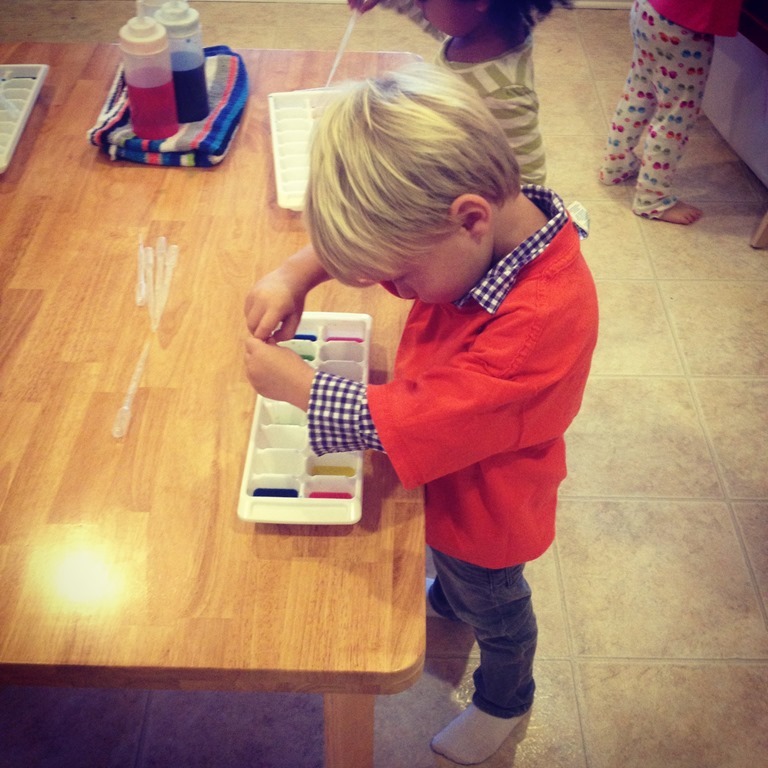 We are going to make our own class set of paints by having the children mix them on their own! 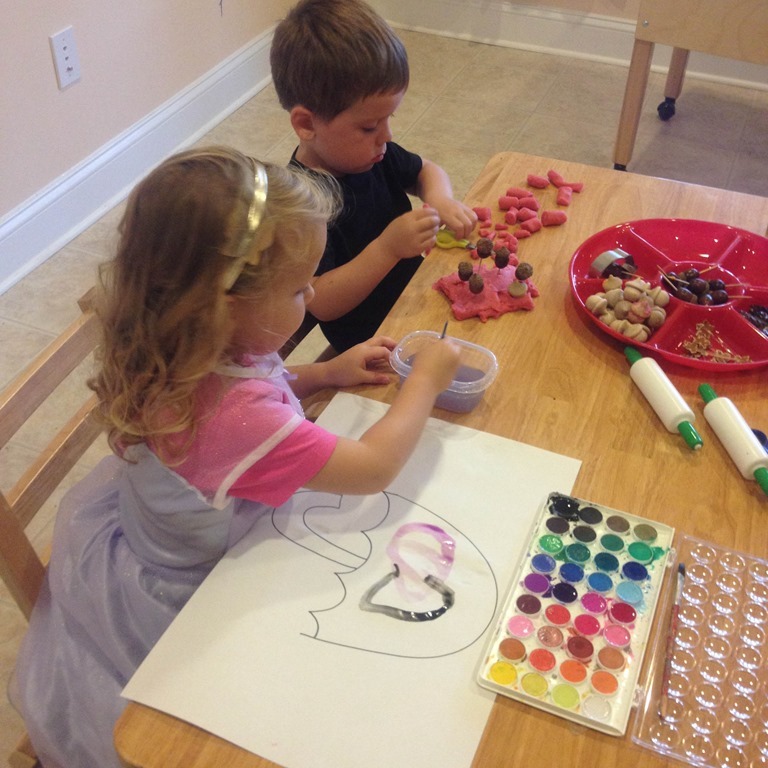 Our art activities have been really fun this month! I have tried to balance as much process art and project art as possible. 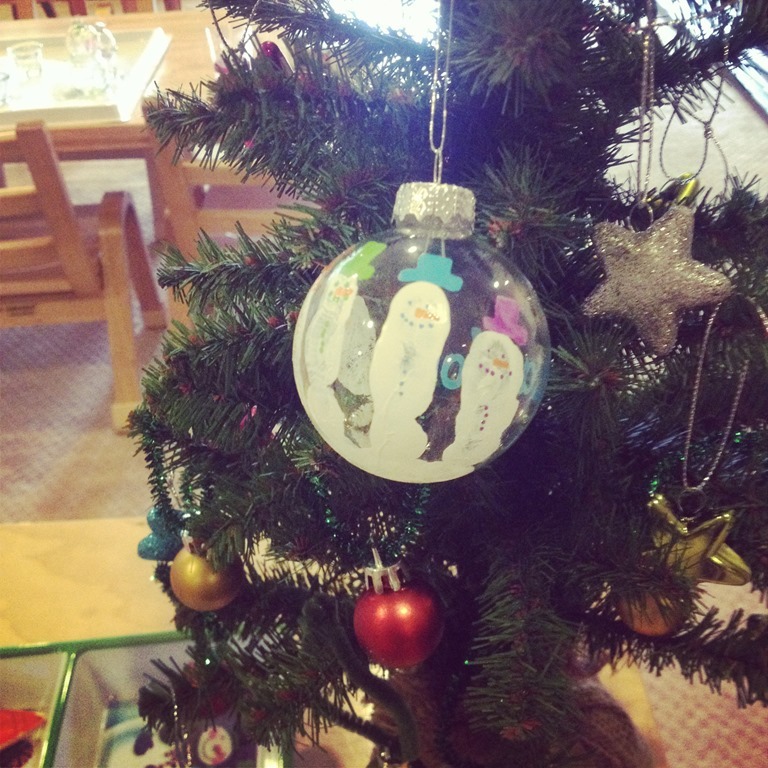 I posted about the importance of process art previously, but I still love to do some “themed” projects especially around the holidays! 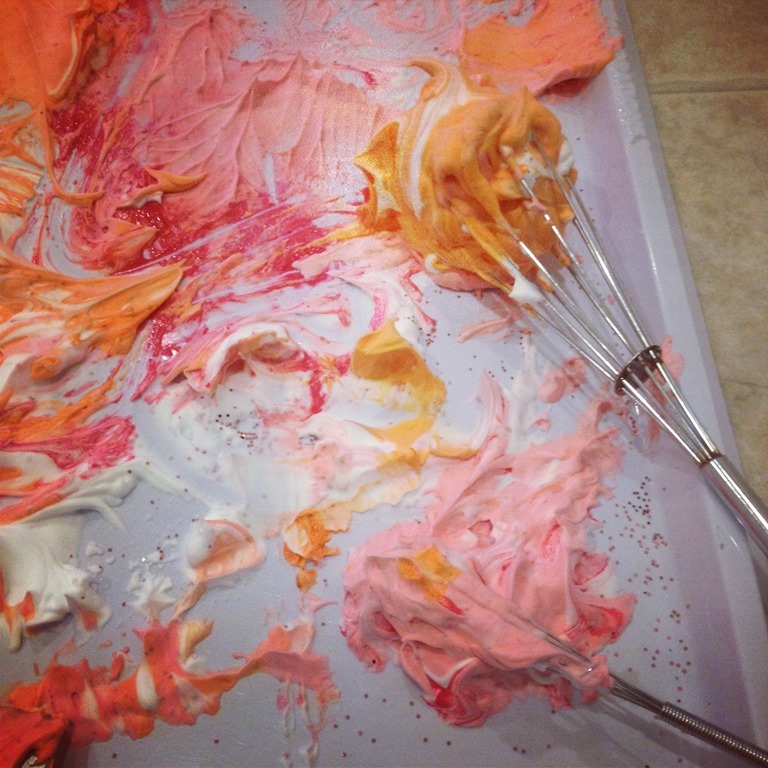 We mixed our own shaving cream paint with fall colors and glitter. 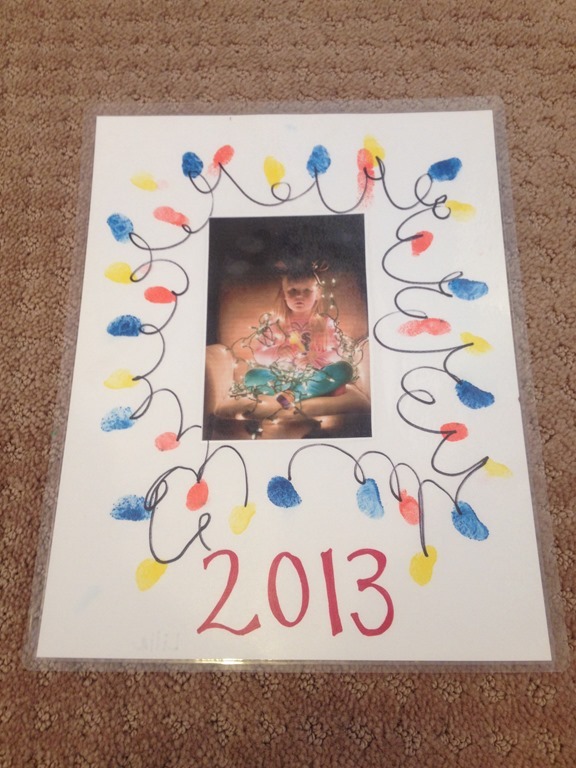 Then we pressed paper onto our paint tray. I am on the look out for a REALLY large branch (hint, hint parents if you come across a cool branch I can hang from the ceiling). 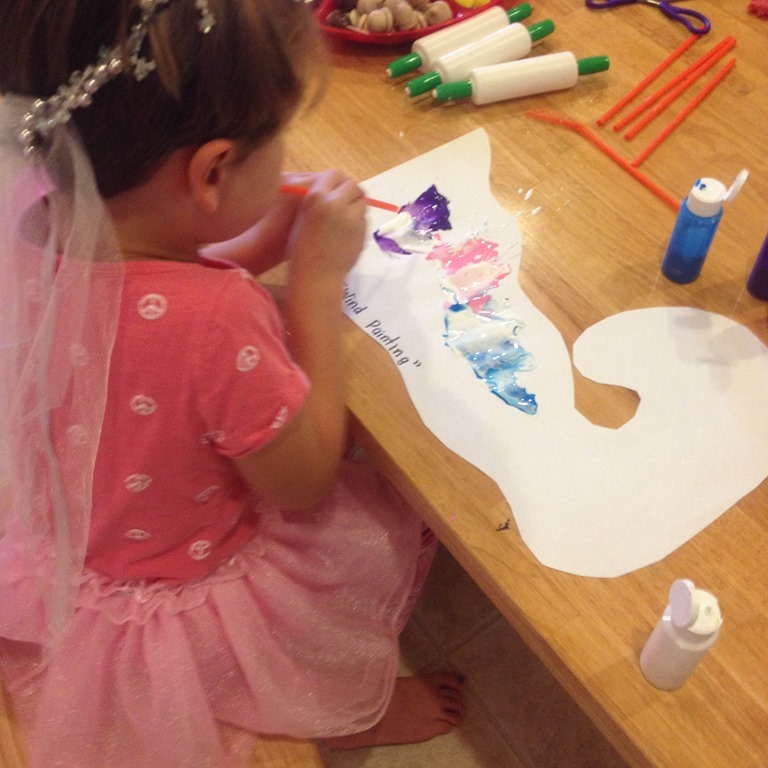 I am going to cut our paper pieces into leaf shapes to hang from the ceiling. 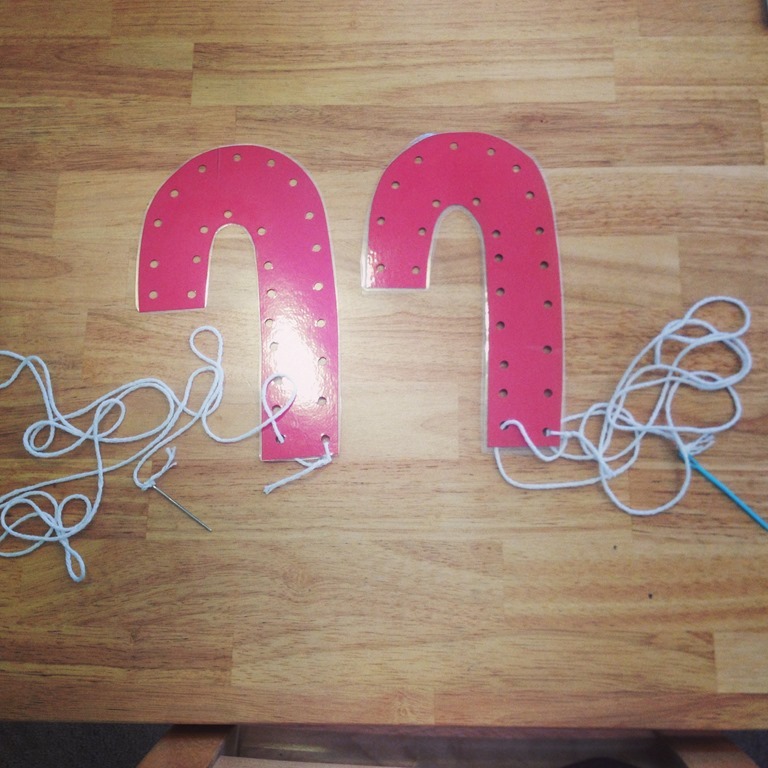 I think mixing paint colors might be the best part! 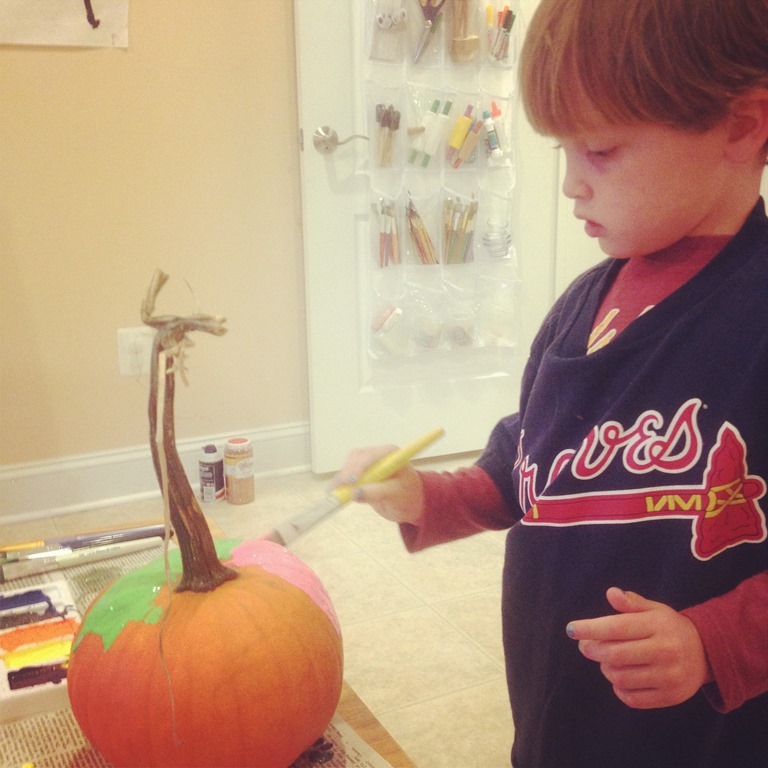 We collected our pumpkins from the pumpkin patch, and I laid out a variety of acrylic paints for the children to choose from. 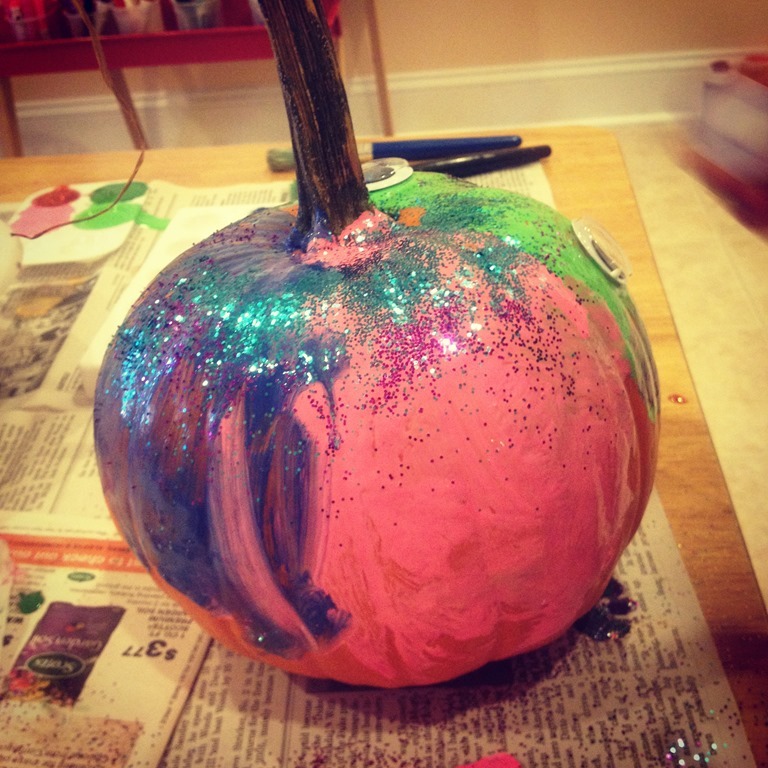 Once they had painted their pumpkin, they could add glitter or googlie eyes for some spooky Halloween fun! 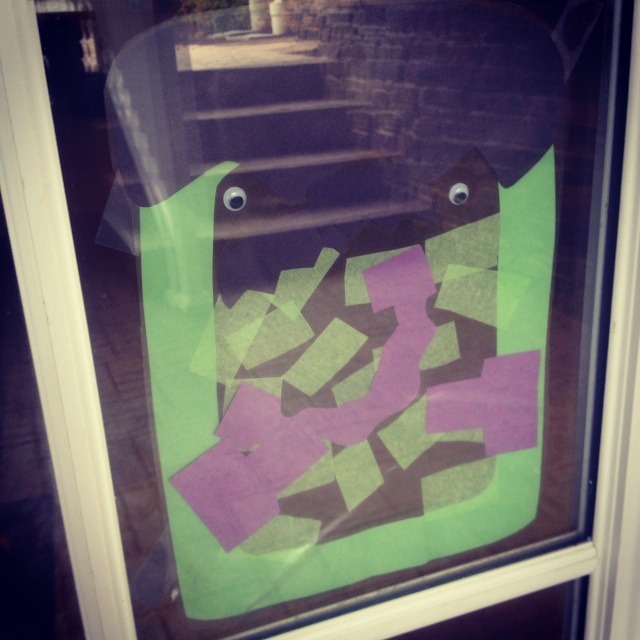 For more of a product art activity the children made Frankenstein for the front door. 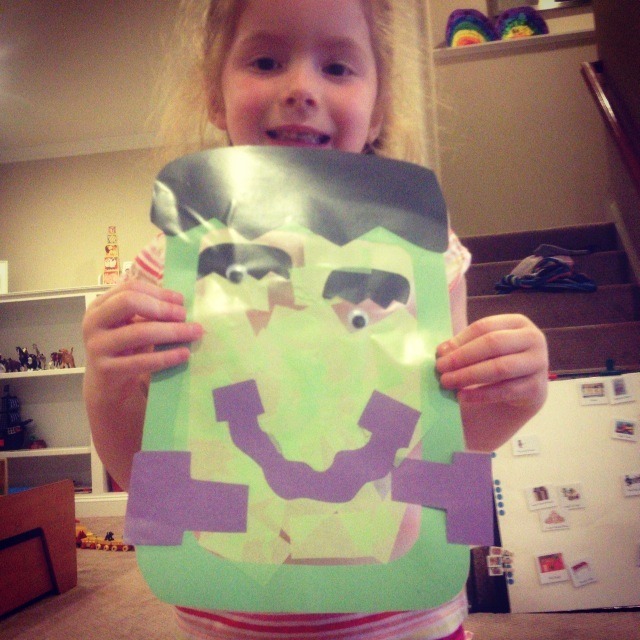 I provided them with the cut out shapes for his face, and they filled him in with tissue paper before we sealed him up! 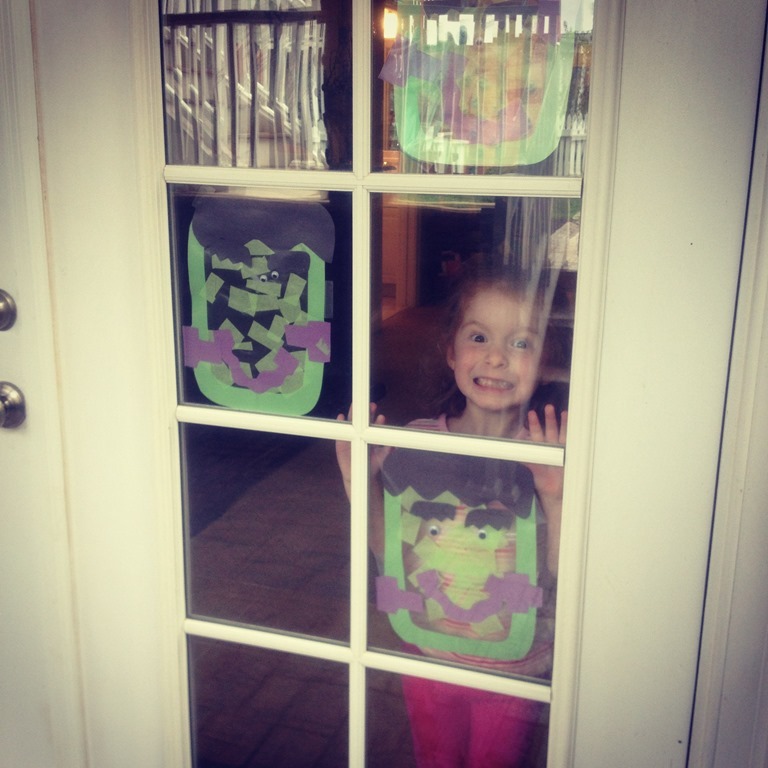 He looks very spooky on our front entrance! 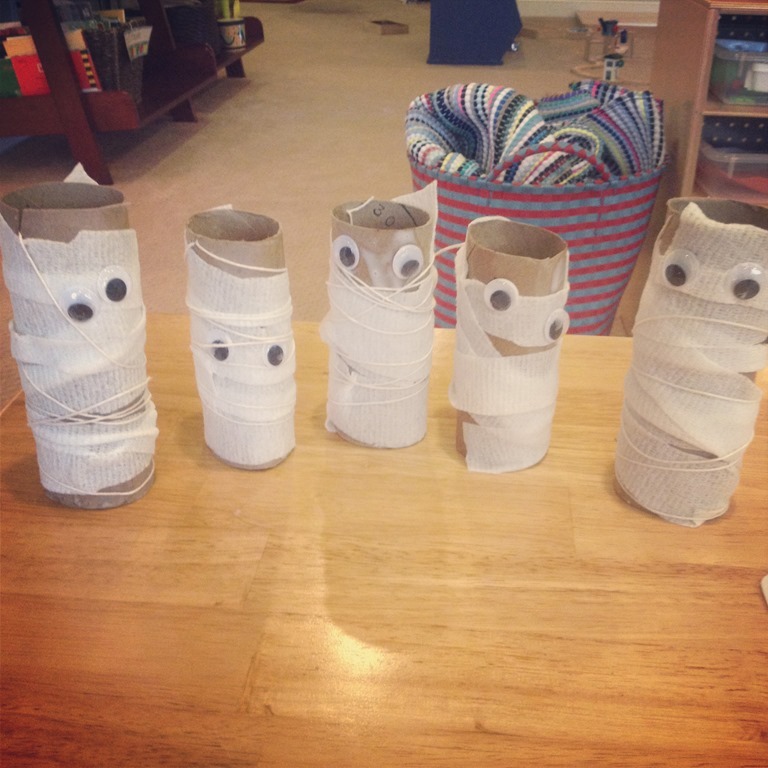 After reading “Where is My Mummy” this month I invited students over to make their own mummies using gauze and a toilet paper roll. 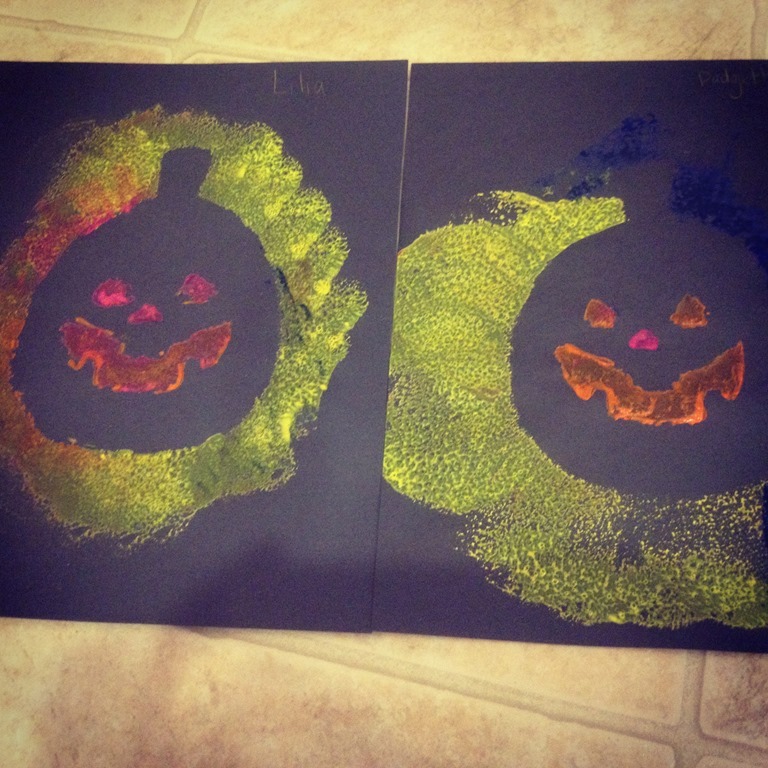 One of the groups did some sponge painting with jack o’ lantern foam pieces. 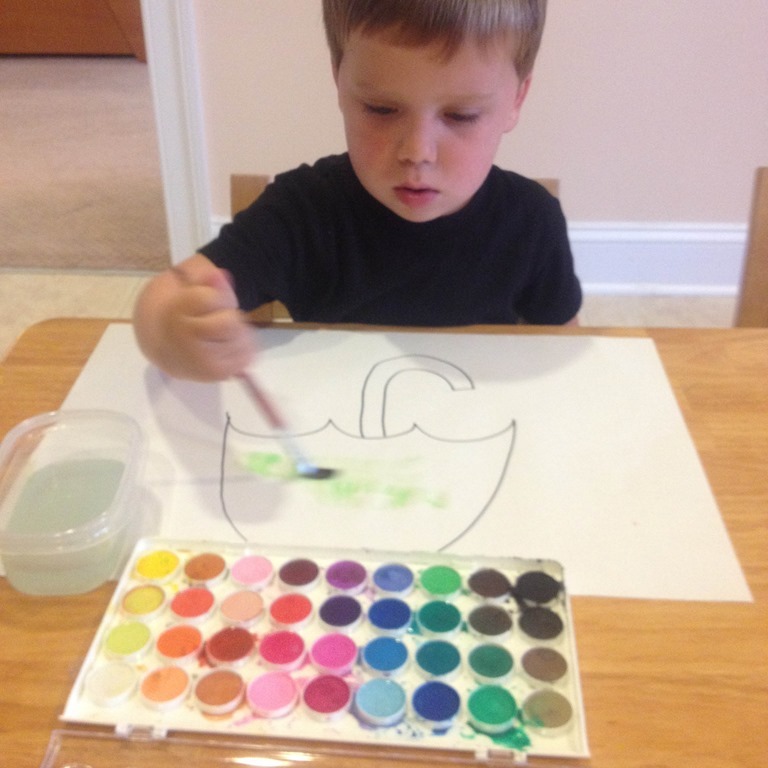 We laid the foam onto the paper and then painted around the foam with different colors. 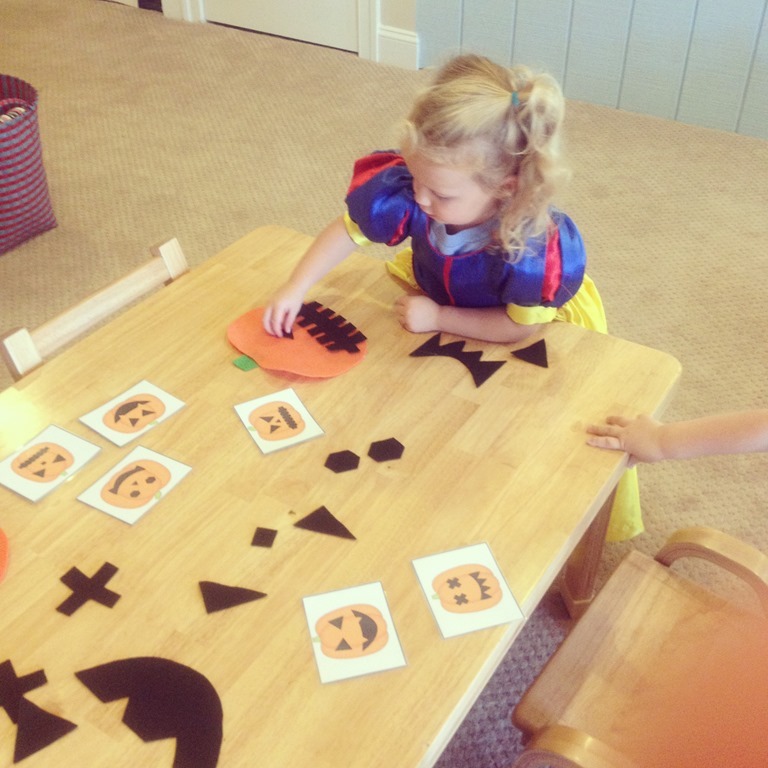 I loved watching their faces as they lifted the jack o’ lanterns off the paper to reveal their pumpkins. 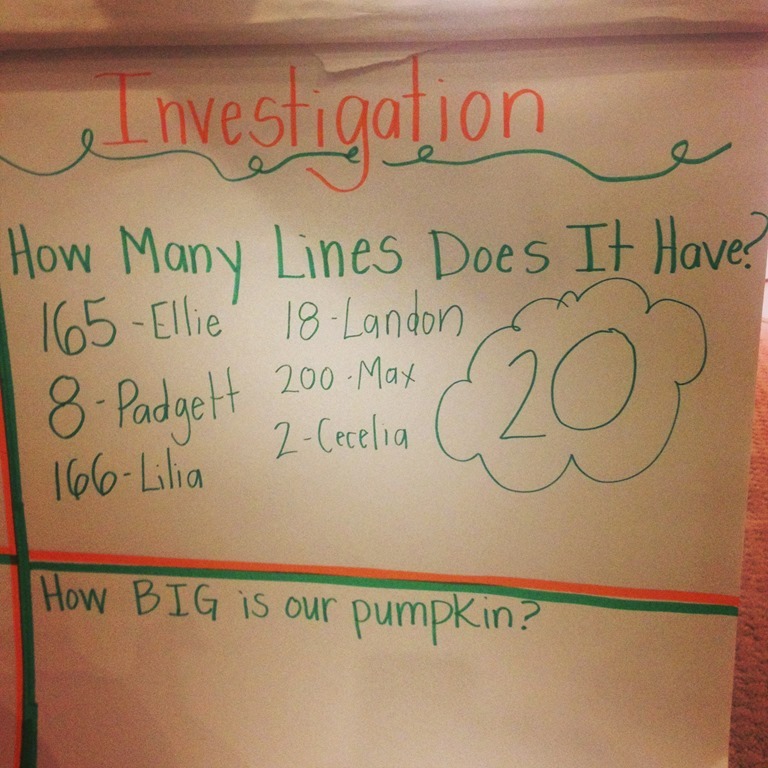 This month we have also been working on a pumpkin investigation. We have been filling out our “investigation” chart little by little throughout the month. 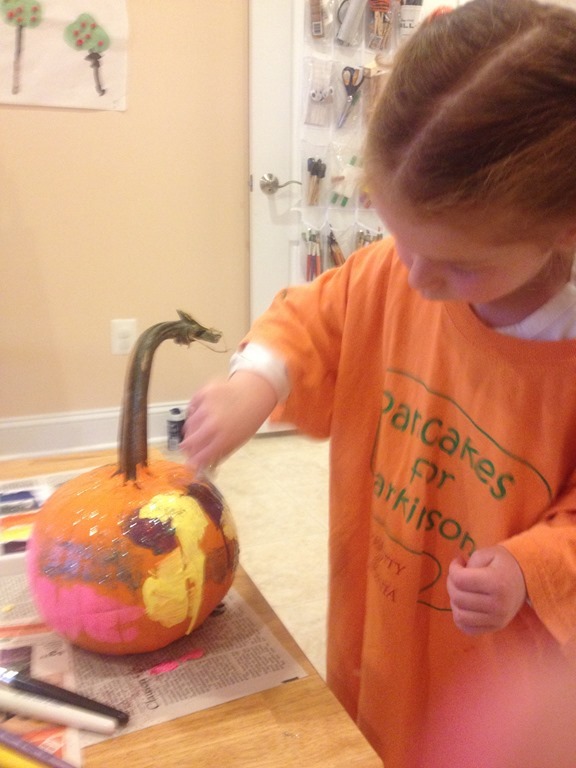 First we thought of describing words for our pumpkin, then we guessed and counted how many lines were on our pumpkin. Third we guessed and then measured how tall our pumpkin was using unifix cubes. 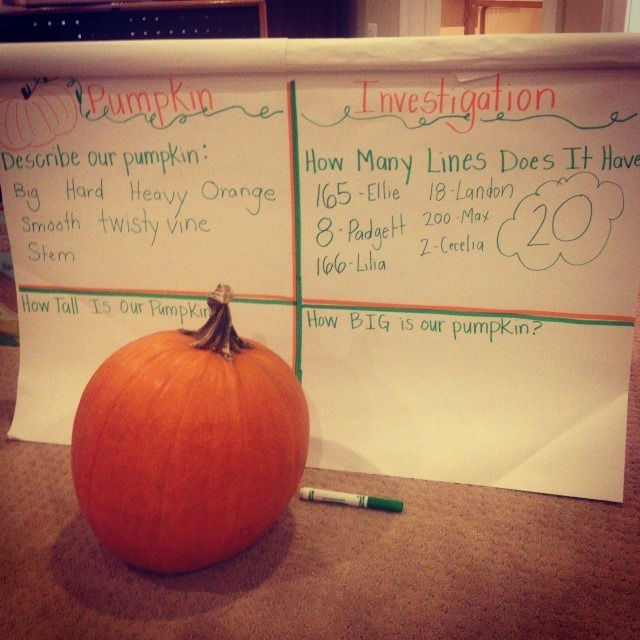 Finally today we wrapped our pumpkin in yarn to measure exactly how big around our pumpkin is. 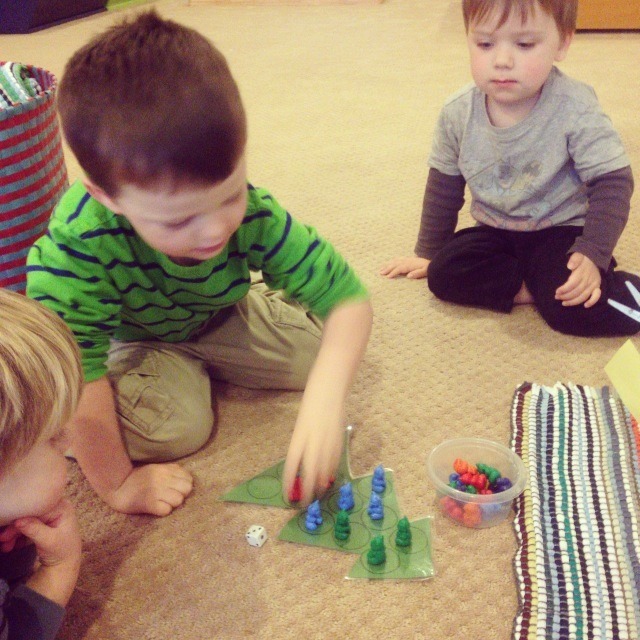 This project has lead to many great discussions about estimating, math, numbers, and exploring an object further than we usually get a chance to. 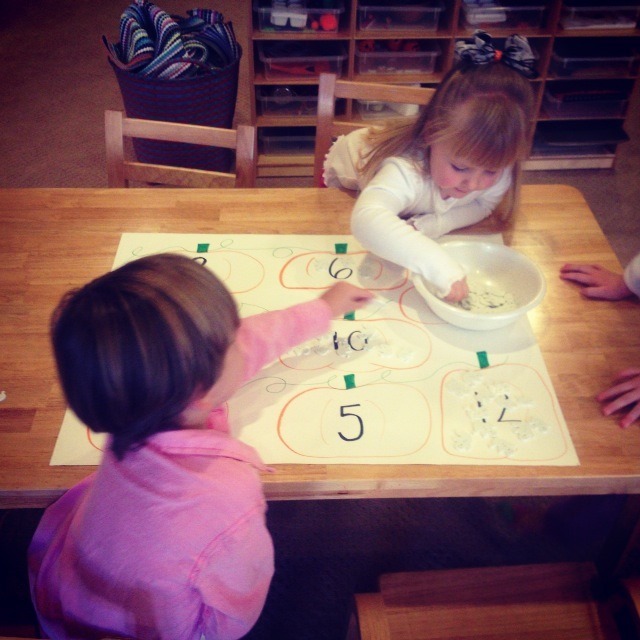 You can see from their numbers that estimating is a very new skill. Hopefully we will get more and more practice with estimating throughout the year. 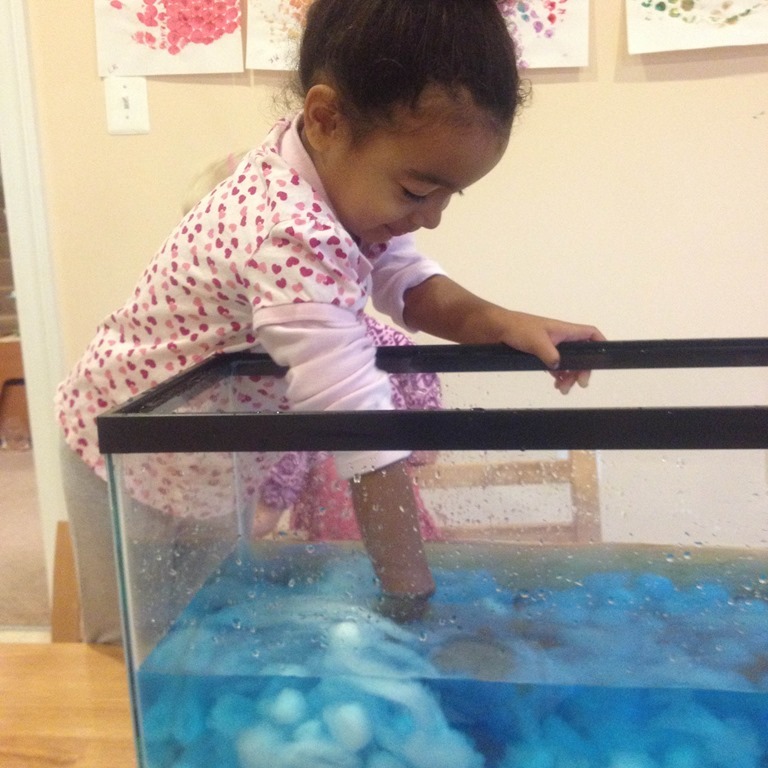 Sensory play continues to be a integral part of our classroom environment. 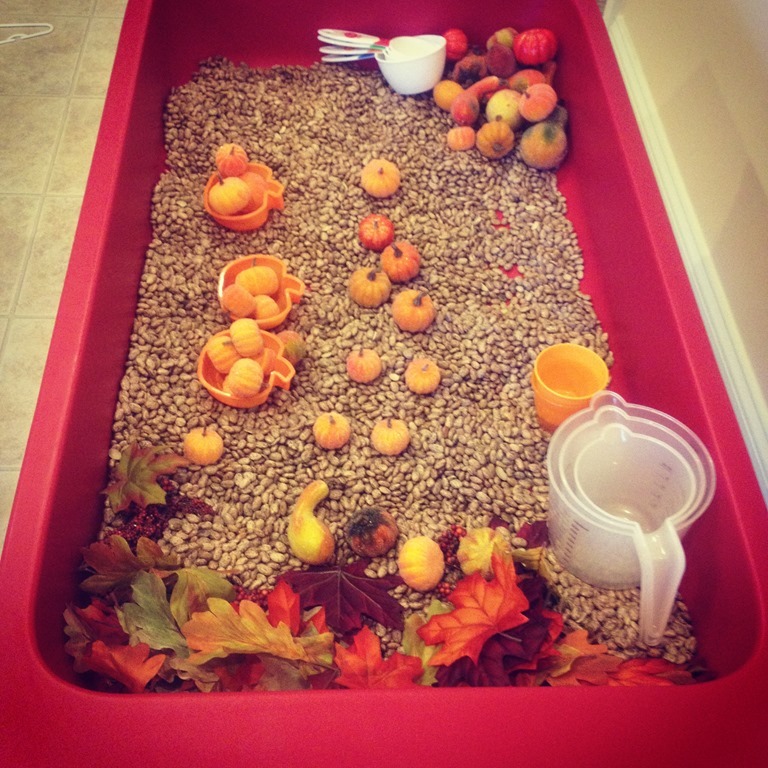 I know that I have posted some of our sensory bins this month, but here is a re-cap. 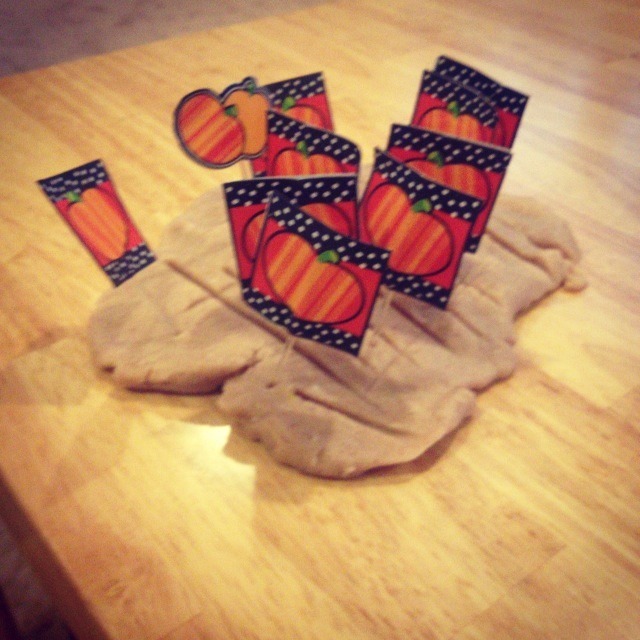 Pinto bean pumpkin patch, beans, scoops, fall leaves, and of course pumpkins! 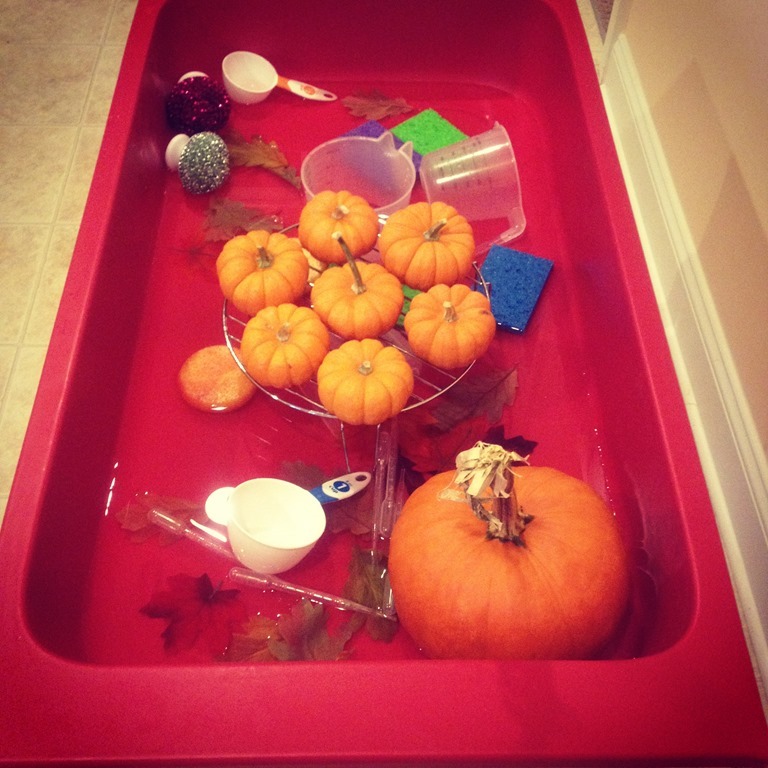 Pumpkin washing: pumpkins, drying rack, scoops, cups, sponges, and droppers. 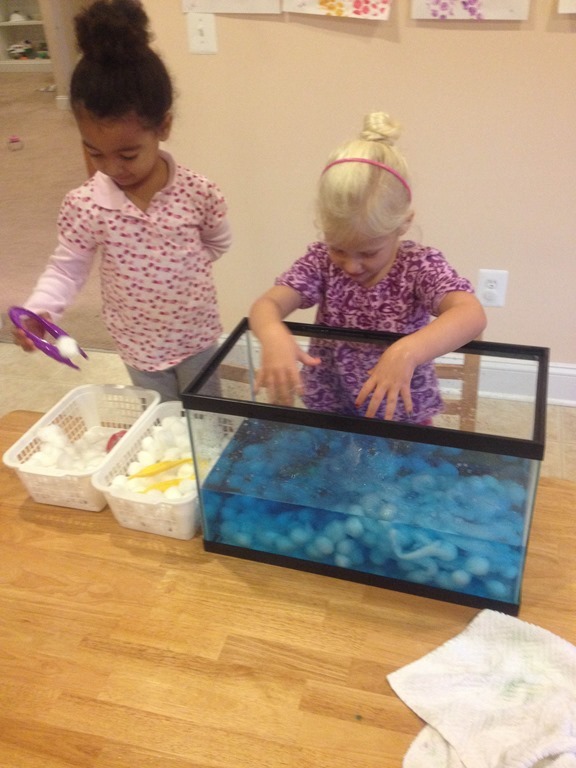 Children spent A LOT of time at this sensory bin. 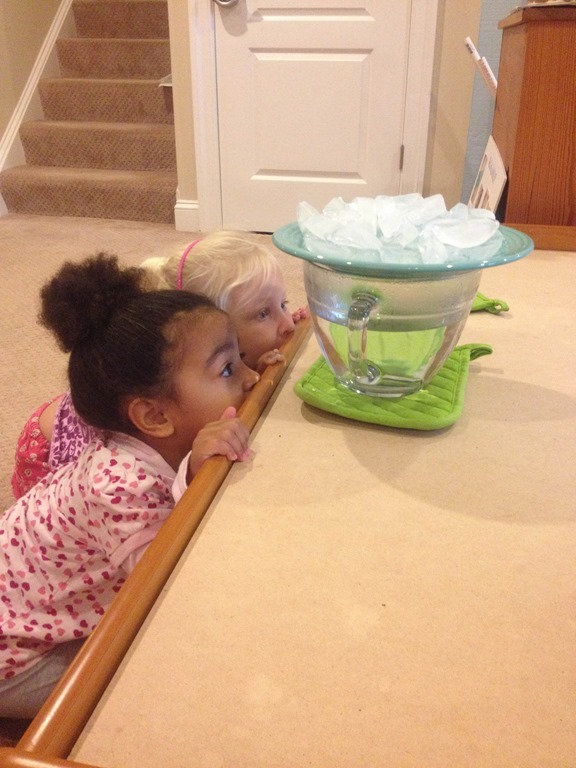 They love water! 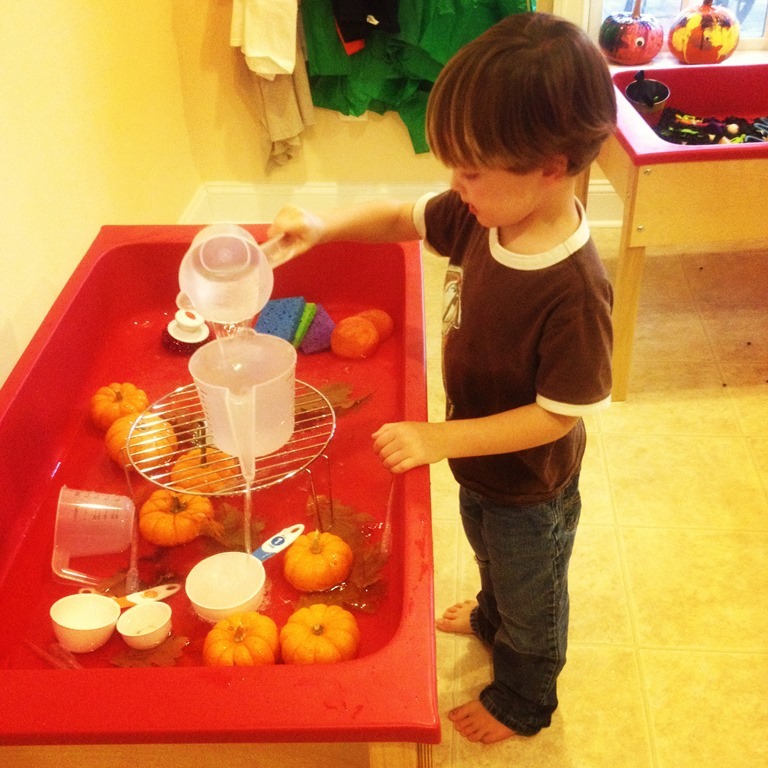 Pouring water on the pumpkins and in and out of cups, and squeezing the sponges was a much loved activity. 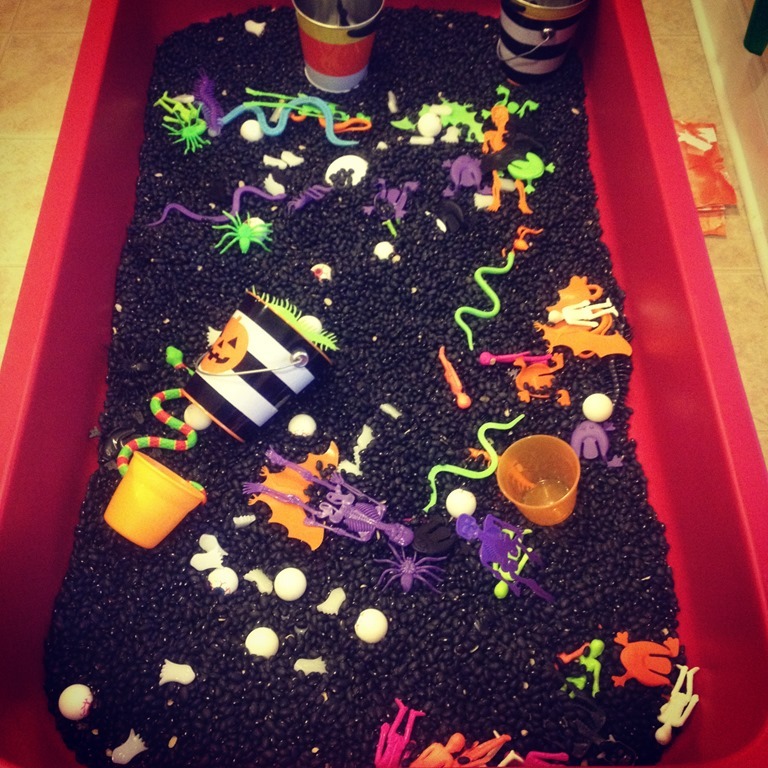 Halloween creepy crawlers: black beans, Halloween items, bouncy eye balls, snakes, and cups and scoops. 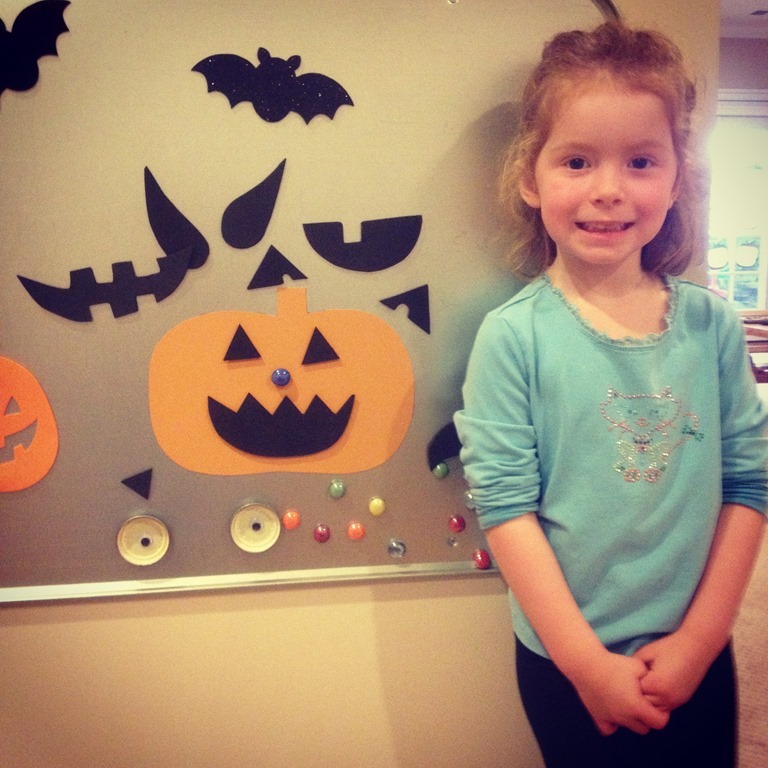 There is still more Halloween and fall fun to share! 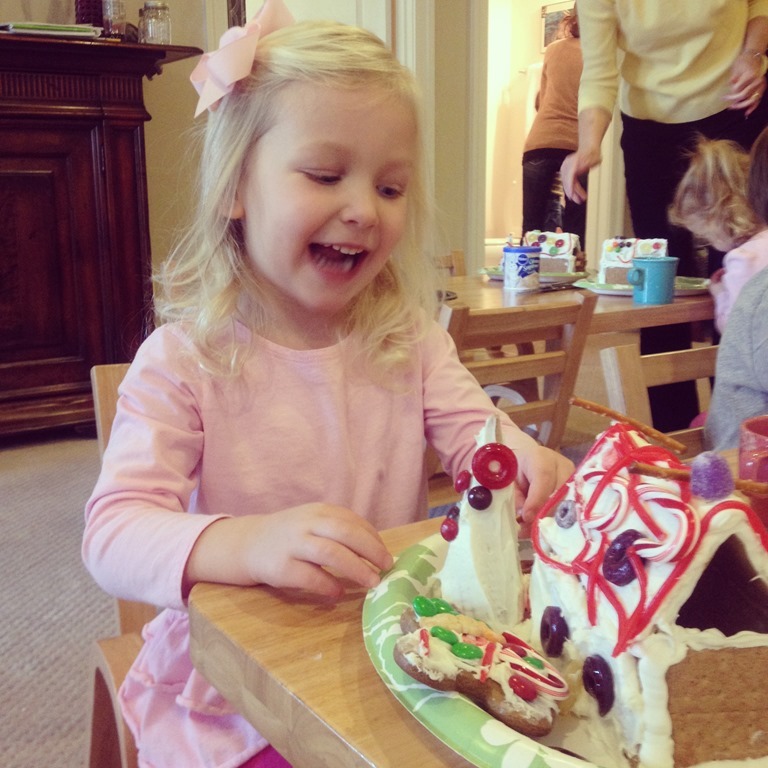 I hope your children are still enjoying their school year, it is so much fun for me each and every day!! 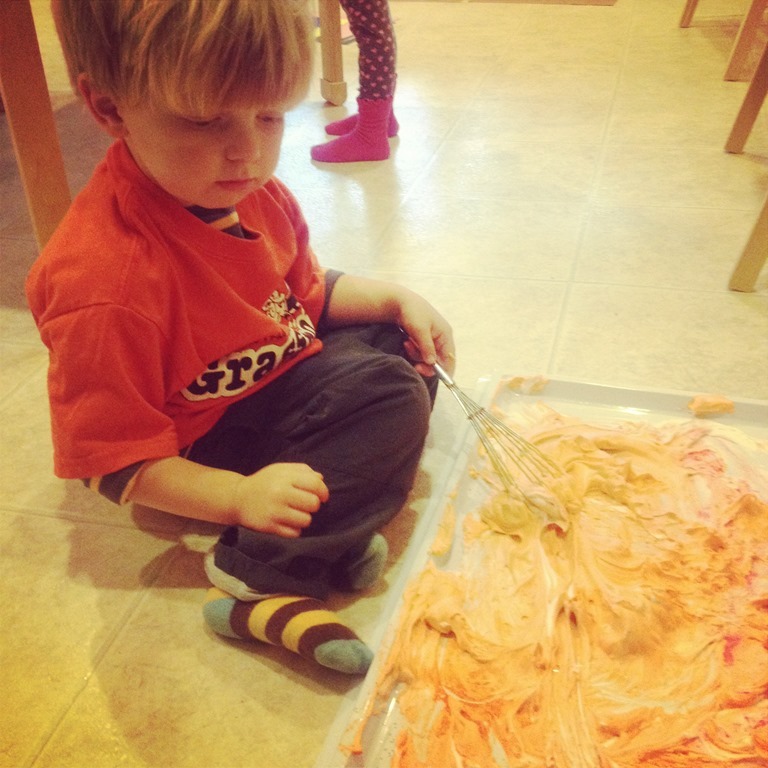 Categories: home based learning, home preschool, play based learning, preschool, sensory play | Tags: halloween fun, halloween preschool activities, play based learning, play dough, playmatters, preschool art, preschool math, preschool science, process art, pumpkins, sensory, sensory bins, sensory play, sensory tables | Permalink.